Now that I have time again in my life, I find that I am slacking off on things! I have to exert extra effort to do things and that kind of enthusiasm quickly declines after one day. Allie of Hyperbole and a Half did a wonderful illustration that pretty much depicts this…in comic form actually! Over the weekend, I attempted to organize my memory card’s ridiculous crap-load of pictures and realized, “Sh*t! How did I let it get this bad?? I haven’t even uploaded minuscule percentage of it for my friends!” Because some of the pictures actually have people in them! And it’s not just food! They know that it takes me forever to upload pictures for them, but because they love me (I hope), they allow for me to continue on with my ways. However, this weekend was to make up for it! For almost a year’s worth of photos, I planned on organizing, backing up, and uploading them for all to see! Well I did promise myself and you, that I would tell the rest of my New Orleans Adventure! Here goes! 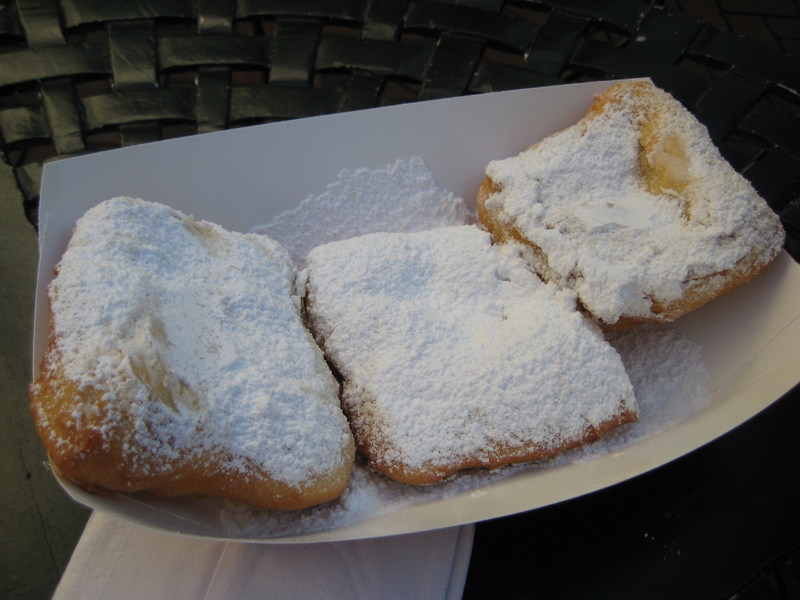 So as you can see…my first official NOLA beignets were NOT from the famous Cafe Du Monde. I was tired, and still reeling from the whole event of the previous night (see Part 1), so I was in NO mood to stand in line for a beignet. 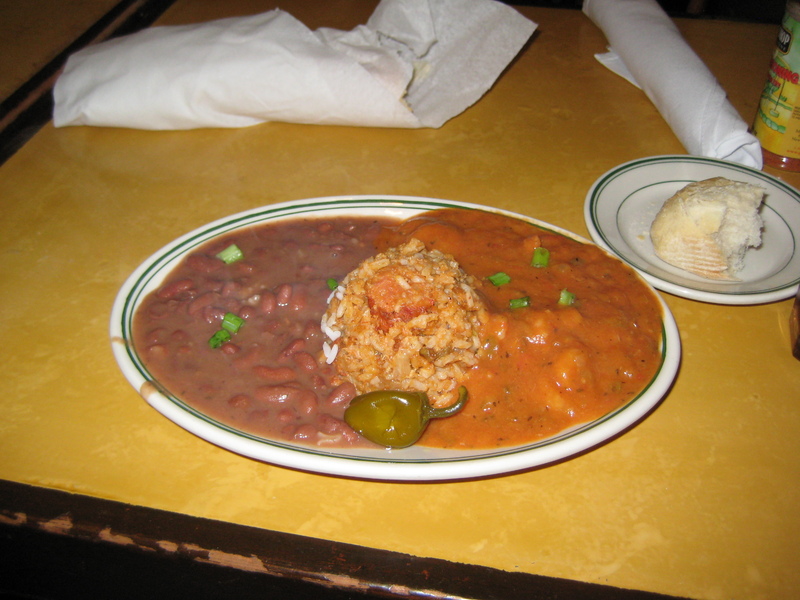 Hence, this little cafe on Bourbon Street was our savior – Cafe Beignet. The FRESH beignets! Oh man…even though our actual food was sitting there, I dug into one of these puppies immediately. And honestly, it was good…yet at the end of the day – they are powdered doughnuts. Don’t get me wrong! I have nothing against it! Or hate it!!! I loved every bite of it, that I came back with CP the following day for another round. However, for me…it wasn’t something that made me go: this is genius! It’s simple, done well, tastes good…there’s nothing wrong with that at all. That evening was done in high style and tradition. CP had made dinner plans for our last evening in NOLA. He wanted to keep it as a surprise from me (which is a hard thing to do!) and I must say, he did extraordinarily! Just all around amazing restaurant. Sitting in the main dining room on the first floor, you can feel the history. That place has seen it’s fair share of faces, lived through disasters, survived through wars, and still manages to show up every night with its bells and whistles on. 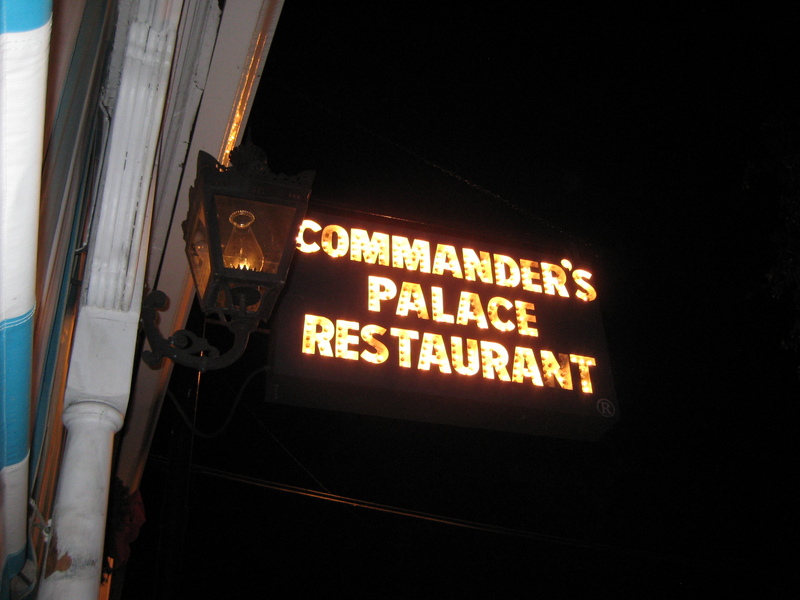 I loved Commander’s Palace and I would come back again. Although it isn’t cheap, it’s worth every penny for the experience and great food. Simple, delicious, and warmed our stomachs to a state of blissful contentment. What more do you need? So that wraps it up for CP’s and my first trip to the Big Easy. There were extreme highs and extreme lows in this trip, and not for the reasons most people associate this town with. Our time there was short lived, but the memories of the sounds, smells, and sights are forever with us. New Orleans…you are one H*LL of a city! 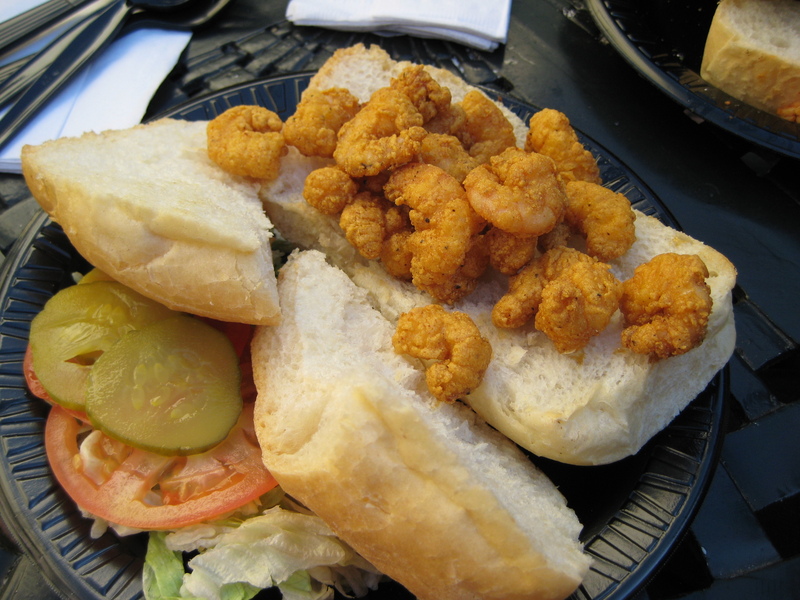 As they say, “Laissez les bons temps rouler! 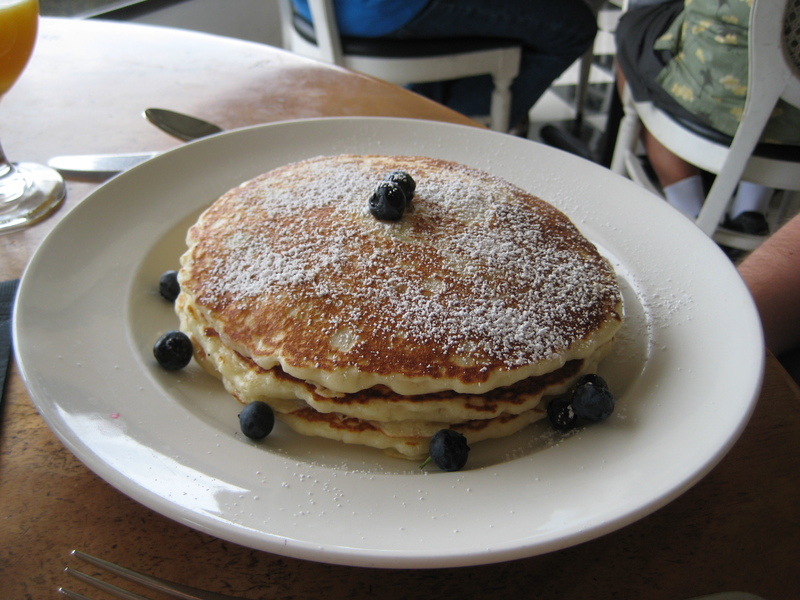 The other day, my friend – LA – and I ventured out to Hillcrest for brunch. Naturally, since we had recently visited Hash House, we needed to visit a new spot. Fortunately for us, I’ve been eying a place nearby for sometime now – R Gang Eatery. This restaurant pretty much looked like it was once a big house, that was converted to a restaurant. Maybe it was because of that, the central air system was not quite up to par to a restaurant’s. It was a hot day by San Diego standards and that place was like a sauna. A tip for you RGE – you may want to look into finding a better solution on your climate control than putting a few fans around that were naturally hogged by those who were positioned closest to them. Anyways…aside from the terrible heat, our waiter (Chris) was very energetic and super friendly. 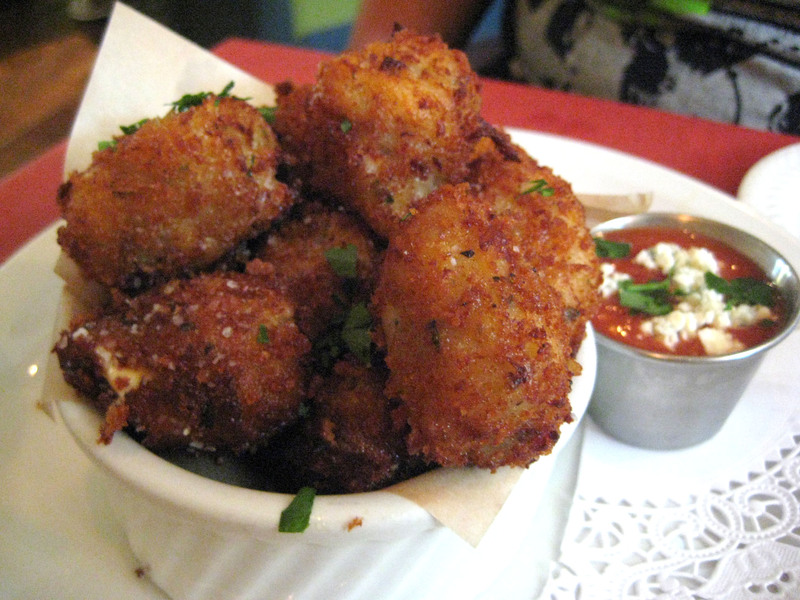 LA and I were already decided on what we really wanted from this place – their tots! 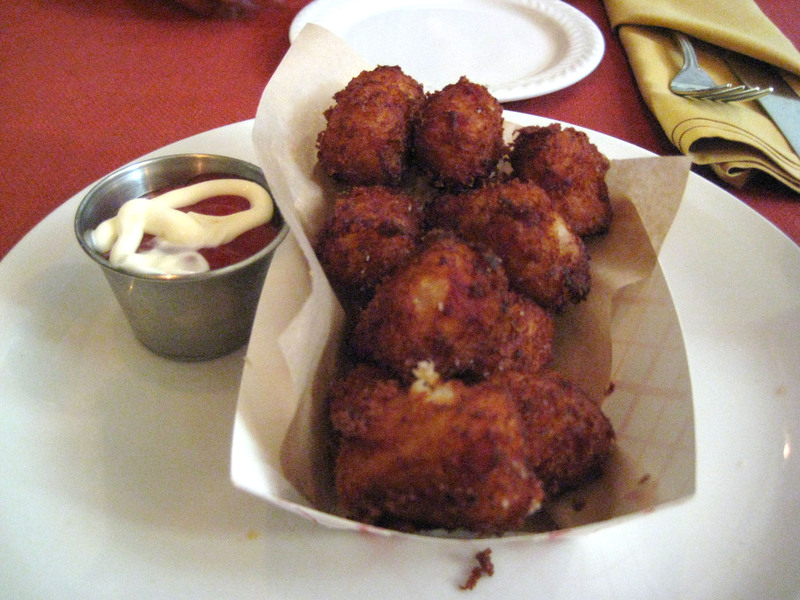 We ordered both of their current specialty tots – the White Trash Tots and the Buffalo Tots. 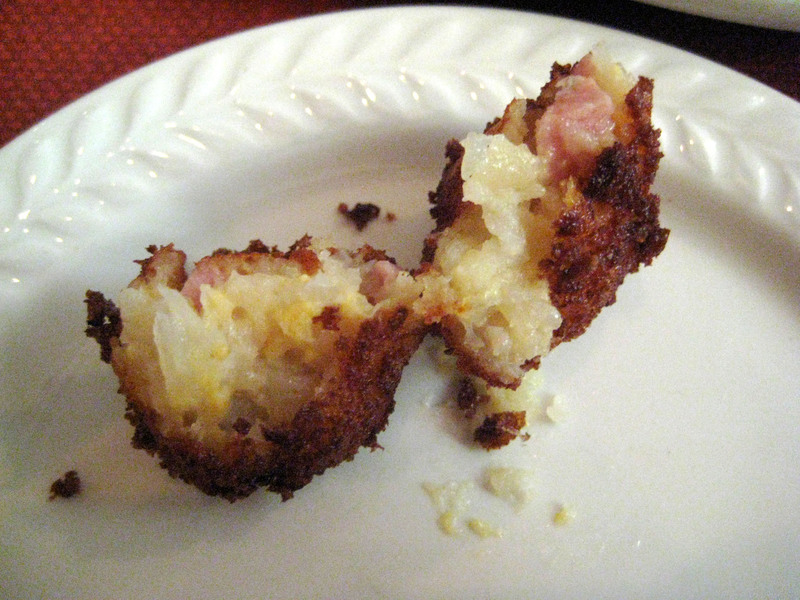 White Trash Tots – tater tots stuffed with diced Spam and Velveeta Cheese, served with “ketchayo” (ketchup & mayo). These were a bit of an oddity. I felt that there could have been more spam, and the velveeta gave it an odd taste. Maybe I’m just not accustomed to the cheese because it is definitely not the Spam’s problem! 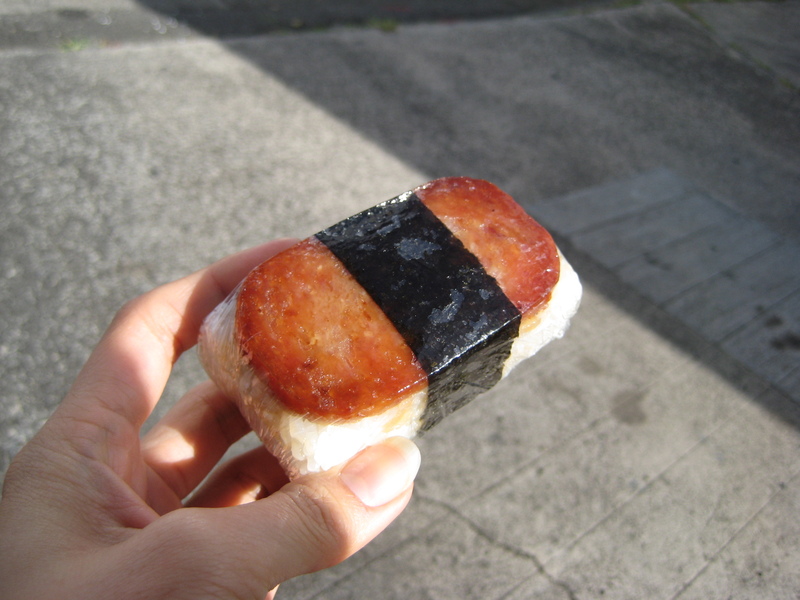 I LOVE Spam since I grew up on it! 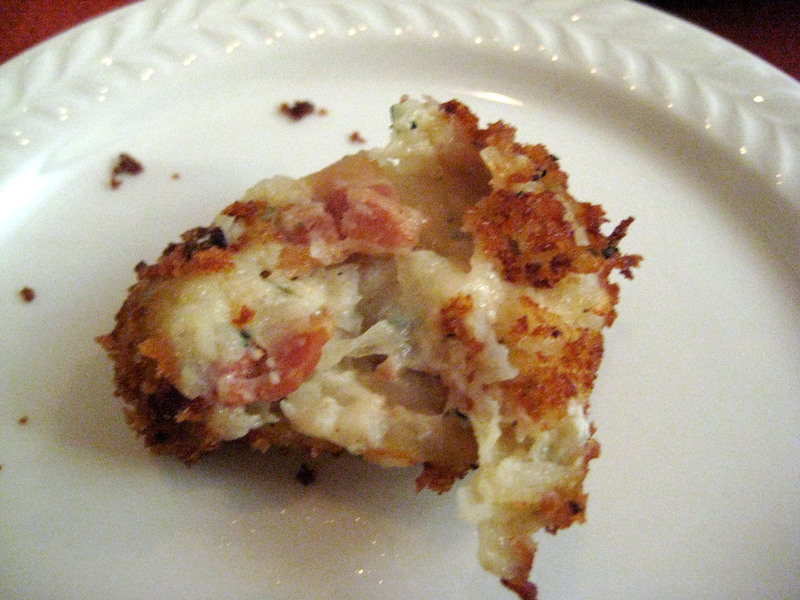 Buffalo Tots – tots stuffed with blue cheese and bacon (!!! ), served with garlic-buffalo sauce. These were by FAR both of our favorite tots between the two! Oh mama! The smoky and delicious bacon, with the cool bleu cheese, dipped in the tangy buffalo sauce, made you feel like you were eating a buffalo wings with fries! In my opinion, they could have done with a little more bacon, but still was our favorite. We couldn’t stop eating these despite the fact we still had our entrees coming. Before that…I must warn you. What I’m about to show you is ridiculously good and totally dangerous! 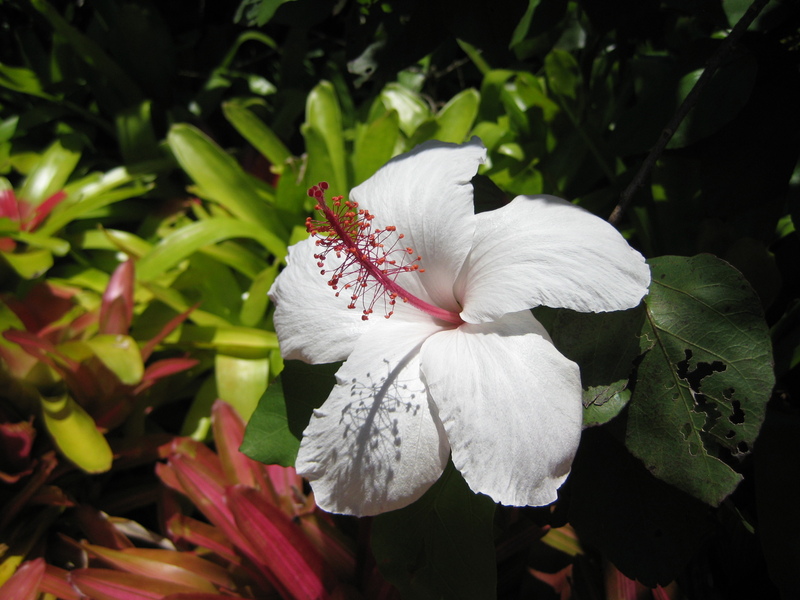 Absorb it all in…look at the beauty that is before you. 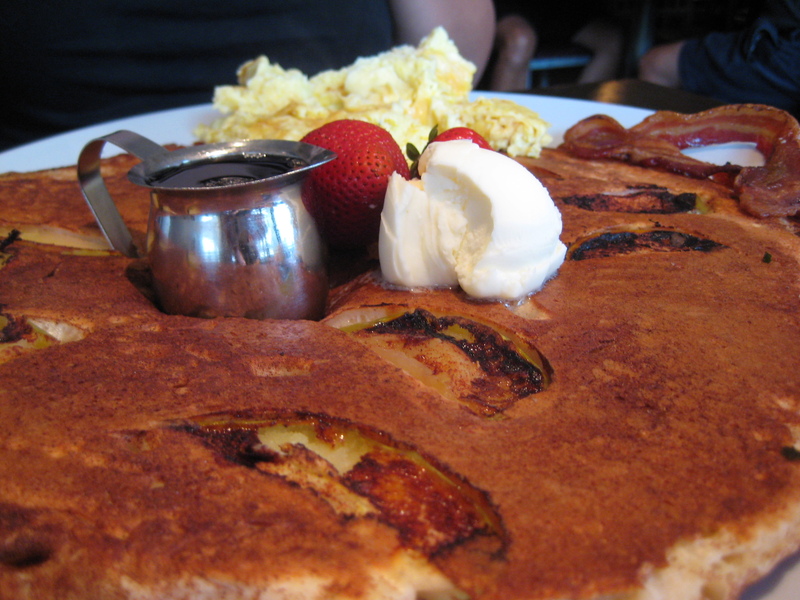 This was not your normal french toast, but rather a bread pudding disguised as french toast. RGE took the regular french toast and elevated it to new heights! 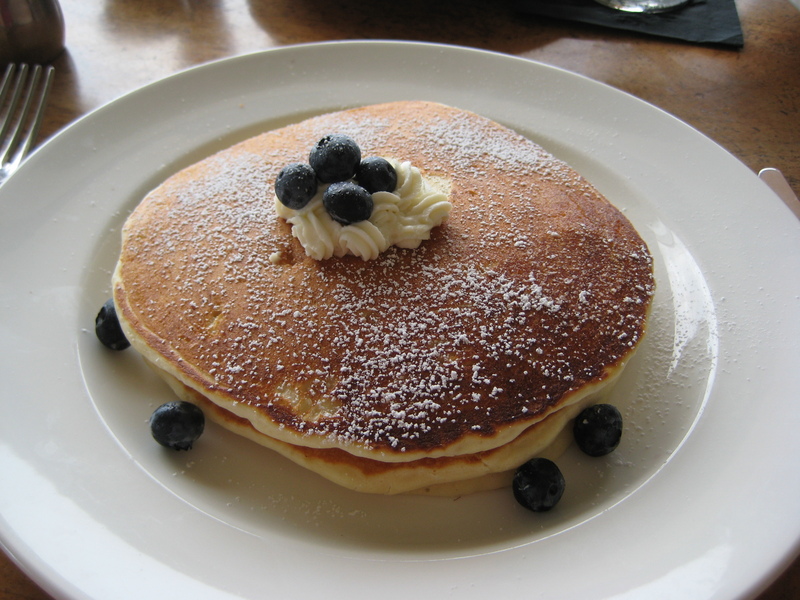 (Though they do offer another french toast entree on their menu…but I can’t imagine it being better than this!) There are cubes of what I believe was brioche, baked in a creamy vanilla-cinnamon custard, then topped off with a bourbon caramel sauce and streusel crumbs. 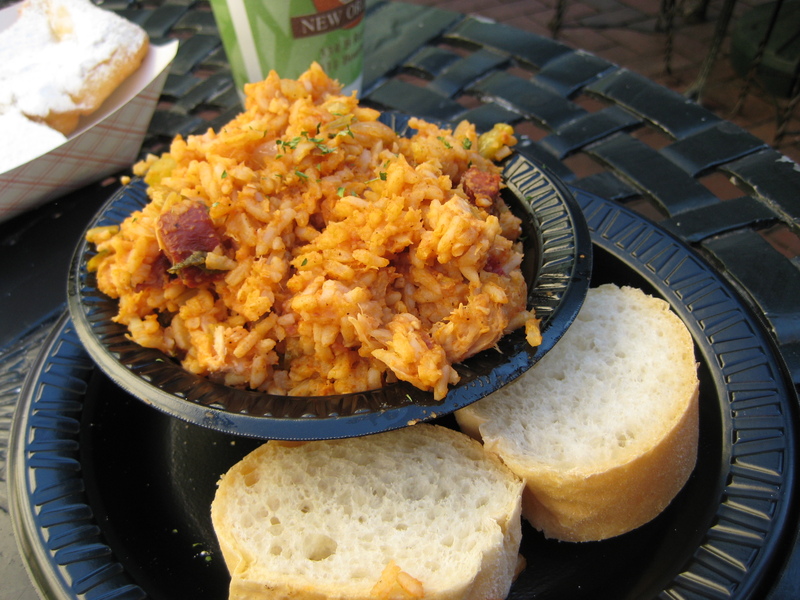 Their online menu tells of a different casserole, but I think the one we had is sooooooo much better! Actually, this was LA’s entree and I wanted it for myself! Soft, salty, sweet, melts in your mouth, and with a kick of bourbon to remind you that you are at brunch. Oh sweet, sweet jebus! 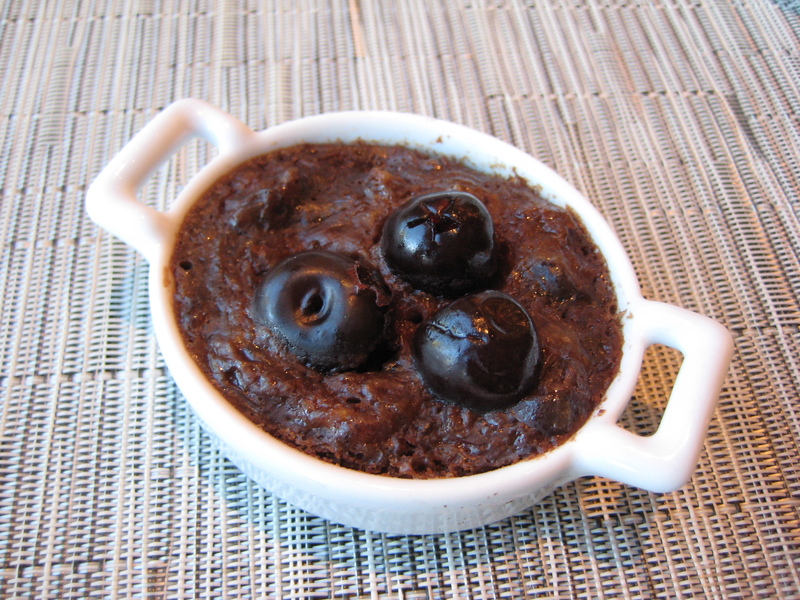 This was not a brunch item – it was a freaking dessert for breakfast/lunch! All this needed was some vanilla ice cream or fresh whipped cream…and we’d be set. 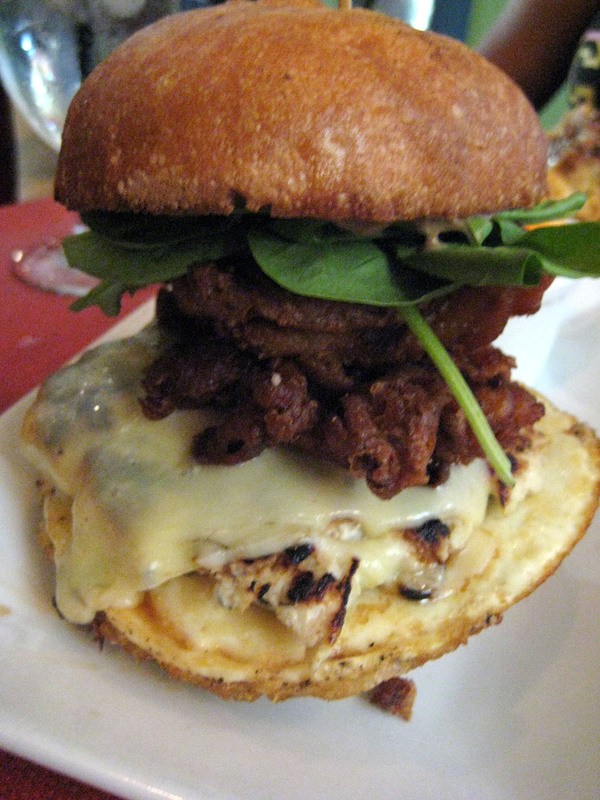 The R Egg Sandy – fried egg on a focaccia roll with RGE’s house-made chicken apple sausage, topped with fontina cheese, spinach, and crispy onion strings. Sounded delicious! The actual result was somewhat lackluster despite the size. I wanted something savory, but this did nothing for me. I wanted that casserole more! Great, friendly service in a casual and fun environment. Could definitely figure out their climate control for those abnormal San Diego weather spikes (whether it be hot or cold). Don’t pass up their stuffed tots (especially the buffalo). 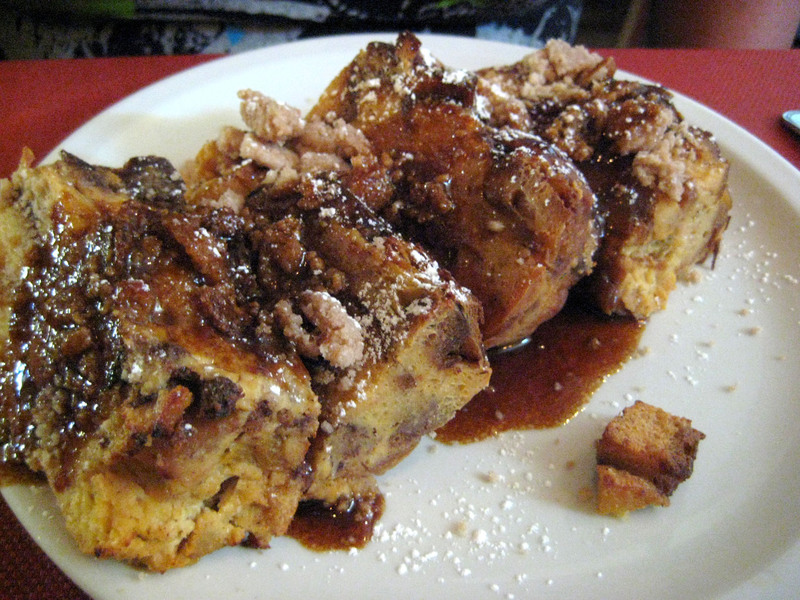 Must try the French Toast Casserole. Remember to check-in on Yelp for a special discount on their tots. Have reservations regardless of day/time. I’m curious about their dinner menu and would come back to try, but if nothing else…I’ll be back for that casserole! I have been a resident of San Diego for the past 14 plus years, but I have never been to the breakfast icon of the city: Hash House A Go-Go. Although, their claim to fame is mostly their enormous portion size, which gives their servers the most wicked upper body workout. The reviews I’ve read online and the word of mouth have been somewhat mixed for me. That’s probably why I never made it a mission for me to go. Then about 2 weeks ago, my friend asked if I wanted to go to breakfast with her since she was craving HHaGG. I decided that there was no better time than now to finally give this place a try! So bright and early (TOO early) on a Monday morning, I met up with my friend to get my first dose of Go-Go! 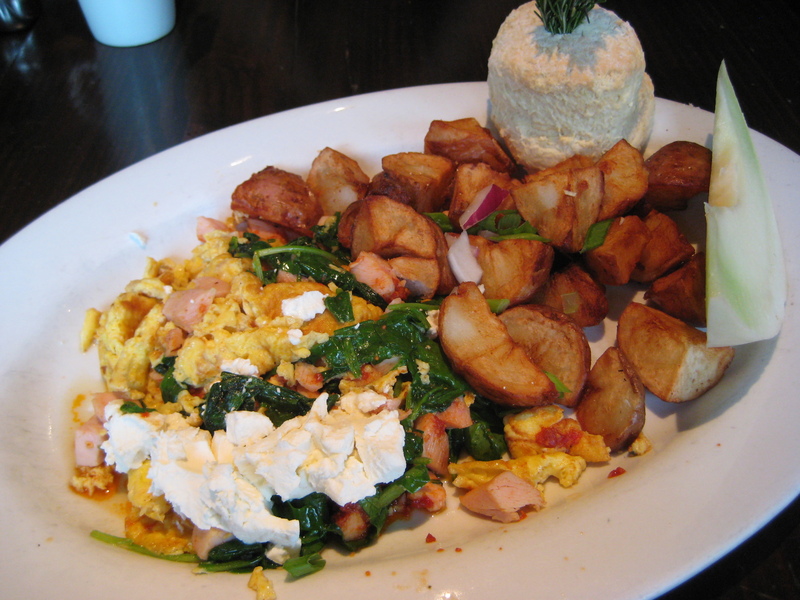 This is the smoked chicken, sundried tomato pesto, spinach and goat cheese scramble. 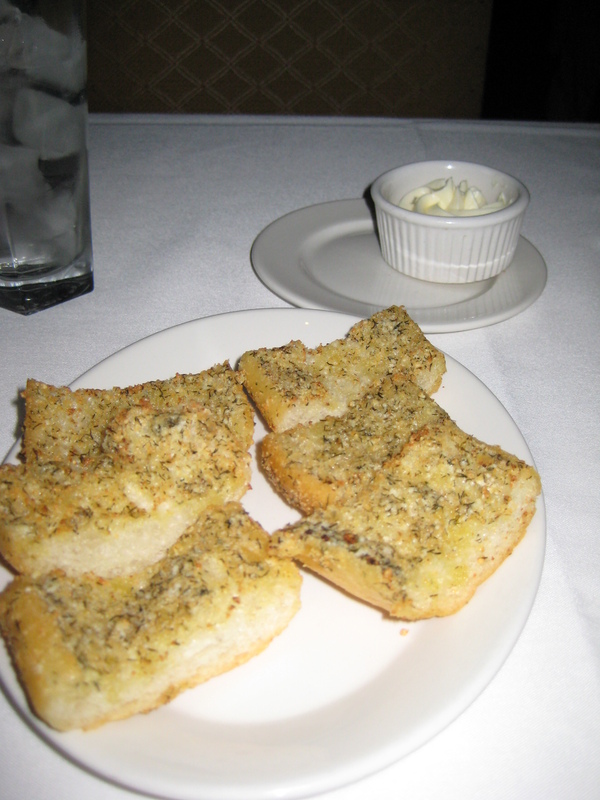 It comes with a rosemary biscuit, fruit, and choice of mashed or crispy potatoes. The smoked chicken was what made this dish spectacular and my favorite component. The soft goat cheese was tangy and smooth, with the wilted spinach to help cut all the heaviness of the proteins. The potatoes were ok, but I am a hashbrown girl so it cannot be helped. That massive biscuit you see in the back was like a rock, but tasted nothing like one. Loved this protein packed start to my morning! My friend went for the sweet starter of Apple Cinnamon Flapjack with sides of scrambled eggs and bacon. This flapjack was the size of a manhole cover! Or a steering wheel! Or a hubcap!!! It was BIGGER than either of our heads! To sum it up – it was HUUUUUGE! Crispy on the outside, soft and fluffy cinnamon cakey filling on the inside, with slices of green apples all around the flapjack. All in all…I’d have to say there was nothing worthwhile to wait for more than 30 minutes for a table. However, if you go early enough during the weekday, I feel that you can have a good breakfast like we did….with lots of leftovers. 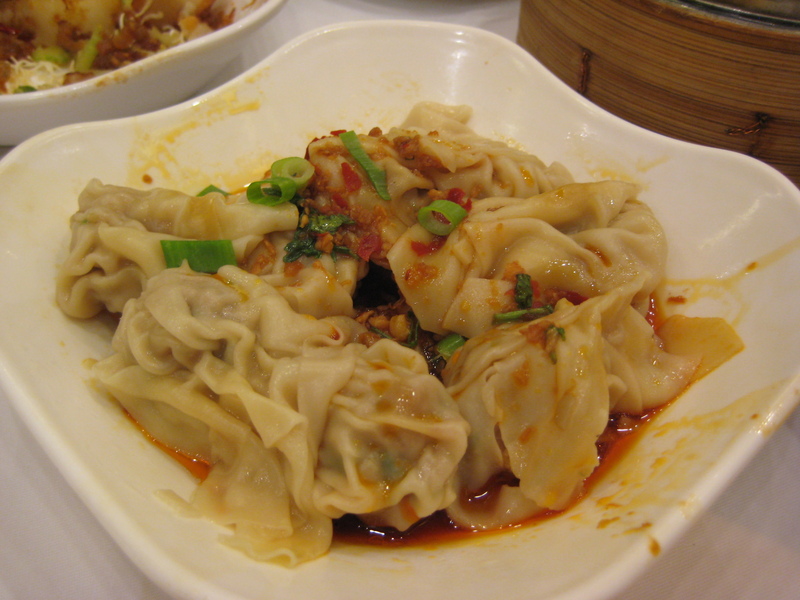 How would it be possible for me to not have one meal which would include Dim Sum while in Hong Kong? That would just not do! Not to mention my fellow foodies would never let me hear the end of it. 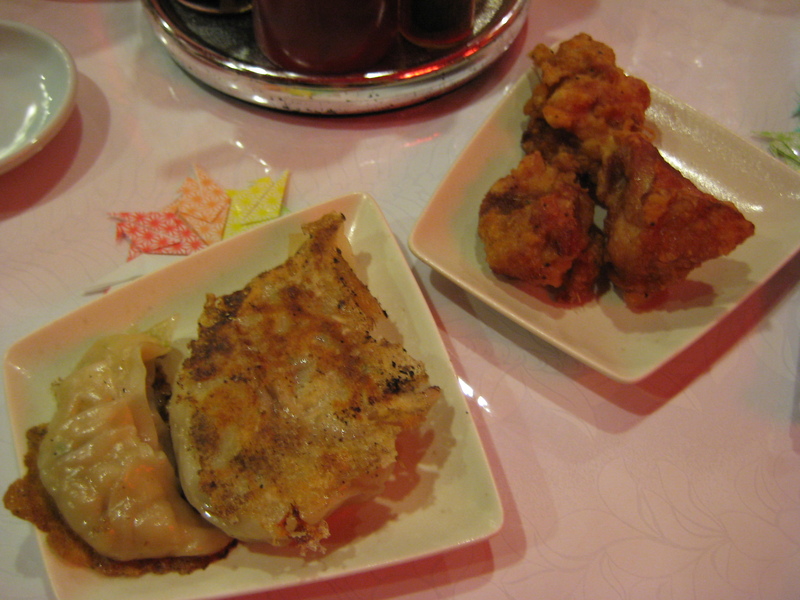 Even though I have been Dim Sum-ed out over the years, I knew I had to try my hand at least one Dim Sum parlor during my short time in the city that comes up with the truly spectacular mini dishes. We had our first Dim Sum lunch with my Mom’s older sister, who took us to a restaurant in a huge shopping mall. Do I remember what the place was called or even where it was near? Sadly I do not, but what do have are my glorious pictures to show you the delicious things we ate. On the left, we have a vegetarian rice noodle roll. There was an assortment of vegetables in the rice noodles and although I prefer the meat variety, the rice noodle skin was superb. Soft, tender, smooth, and thin…mmmm. On the right are BBQ pork pineapple buns. They’re called pineapple buns because of the cracked sugary topping of the bread (or at least that’s how I’ve always associated it). The sweet and salty pork was perfect – little fat, glazed just enough, and tasted fresh (*gasp!*). Man…I don’t really recall ever having any type of pork bun tasting so delicious. And oh! The plate up at the top left is more of that delicious BBQ pork for the bowls of noodles below. 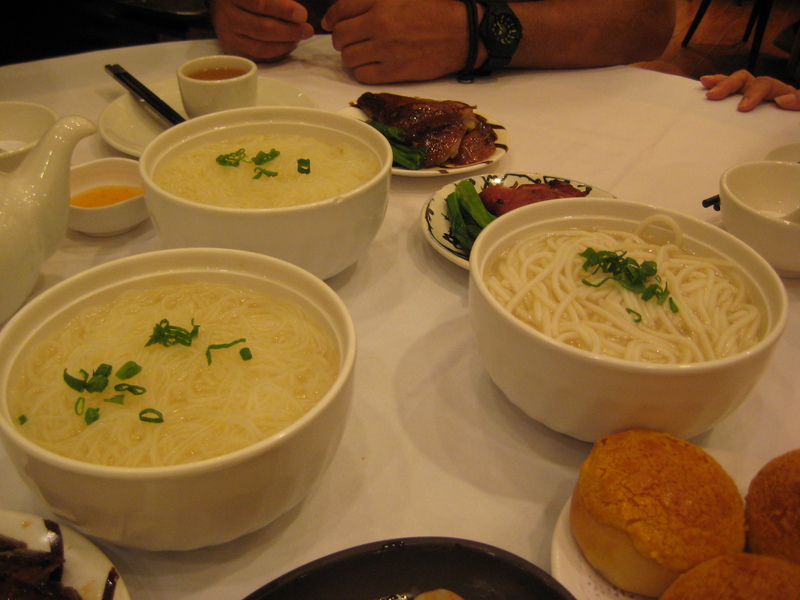 Going clockwise from the top left: “micro-pulled noodles” (x2) and “thin-pulled noodles”. These noodles were ordered upon Dad’s request for them, but when I tried each type, I wasn’t impressed. Thus, I moved on with my eating! 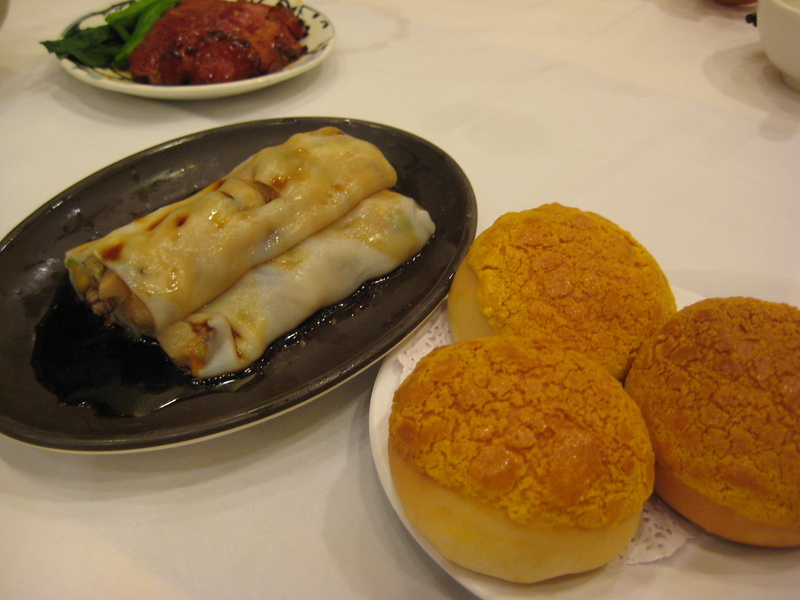 Top left: chiu-chow fun guo – my Dad’s favorite dim sum dish. I took a bite and found nothing special from the usual. Next, the ma lai gou but in the rolled version (top right), which is A MILLION TIMES BETTER! We used to have this version of the traditional ma lai gou in San Diego, but for whatever reason (cost according to my Dad) they discontinued it. Even in the LA dim sum places we’ve been to, they don’t make it. 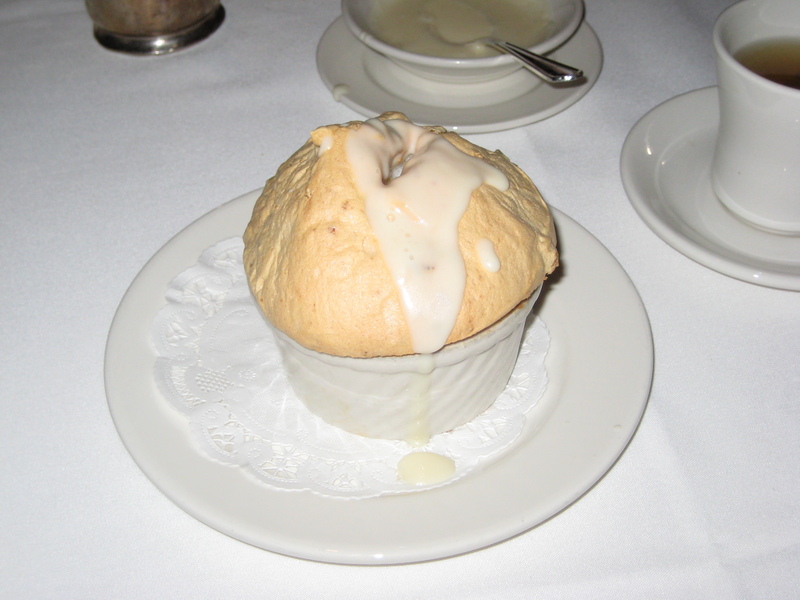 Soft, moist, and the sweet custard between the rolled layers add another level of decadence that is not usually there. The bottom plate is what I call: genius. Delicious genius to be exact. Cubed, pan-fried radish cakes, stir fried with onion, pepper, celery, and TONS of garlic. Add a dash of hot chili oil and we had a terrible time of stopping ourselves from gorging senselessly at this dish. 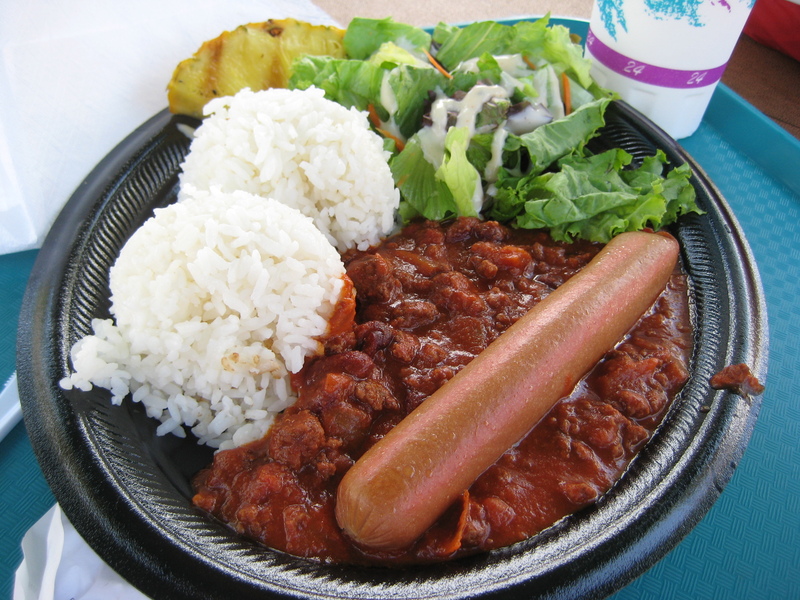 By far, it was the most flavorful and unique dish we had that day. And hands down, my favorite at that table. 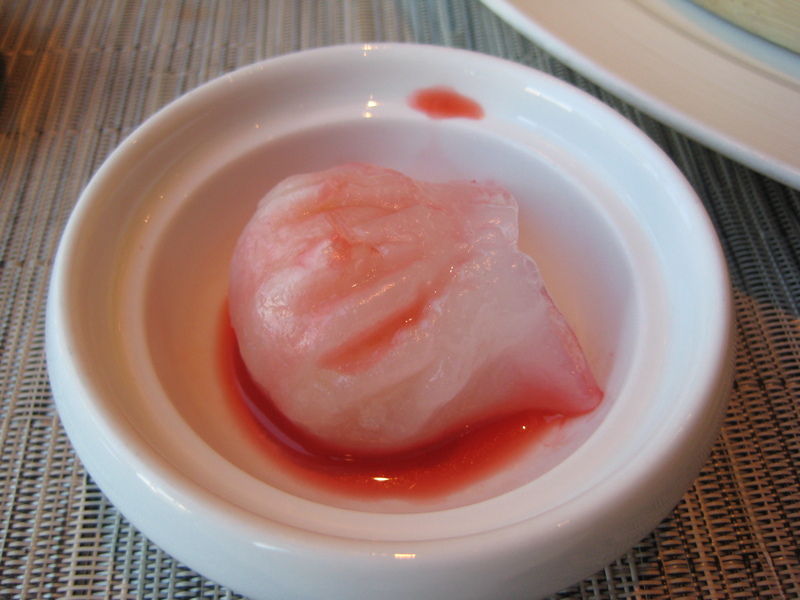 Ok…did this meal help change my mind on Dim Sum? Yes and no…because I know that I could never find something of this level in the states. I have friends and family who go wide and far for good Dim Sum, but they all have told me the same thing over and over again: nothing can compare to Dim Sum in Hong Kong. 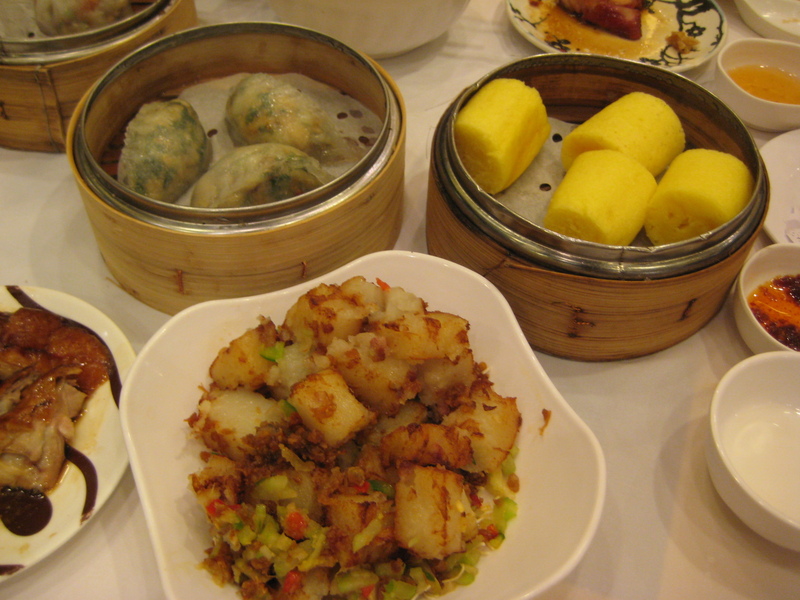 The true masters of the art of Dim Sum resides in Hong Kong. 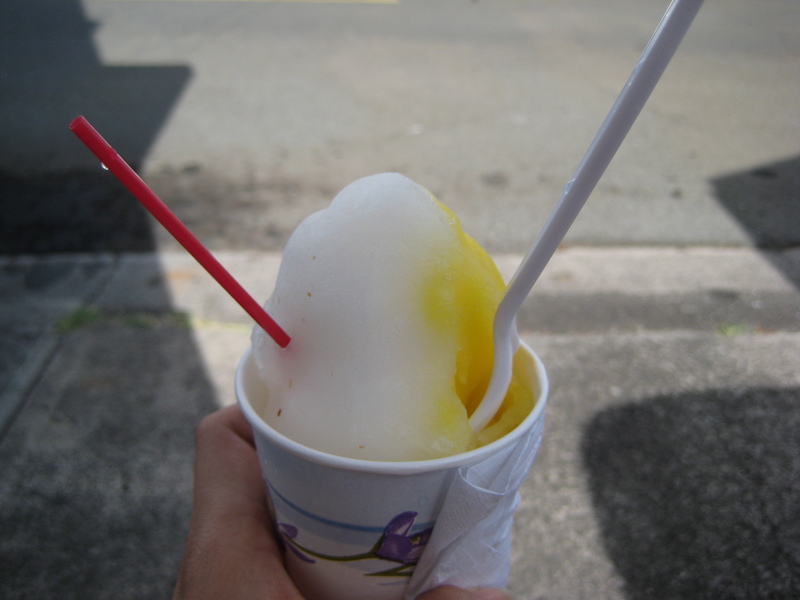 Whether it be in a fancy, sit-down, air-conditioned restaurant, to a side street vendor. The good stuff is overseas and I am glad I partake in this food journey to something I knew, yet knew nothing about. After a day of doing little to nothing, it was time to do something again on our vacation! But before any of that, we needed a proper breakfast to start. 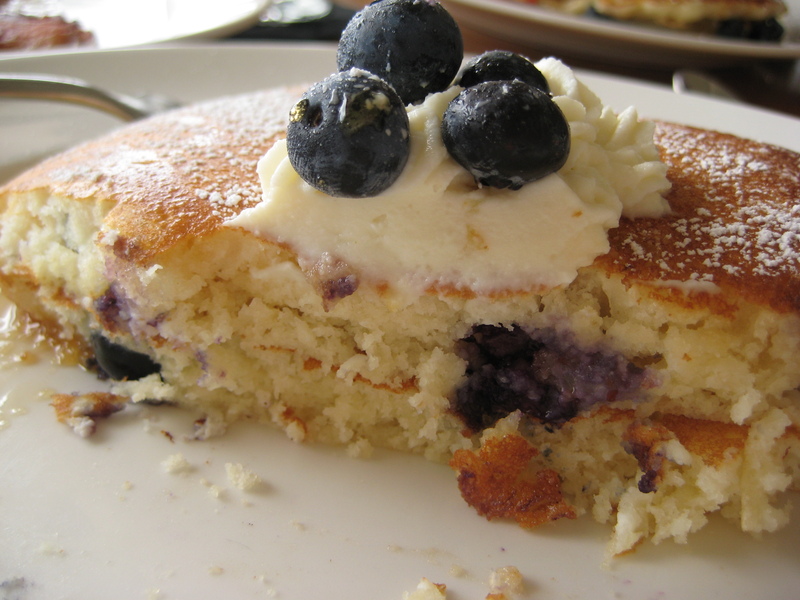 Given that CP’s ideal breakfast are blueberry pancakes, no matter where we are, I found him a place that actually served it (you’d be surprised how hard it was…every place wanted to put either bananas or pineapples, which is not all that surprising since we were in Hawaii). I had made it through half of the stack before I decided that it was a better idea to walk away than to push through. 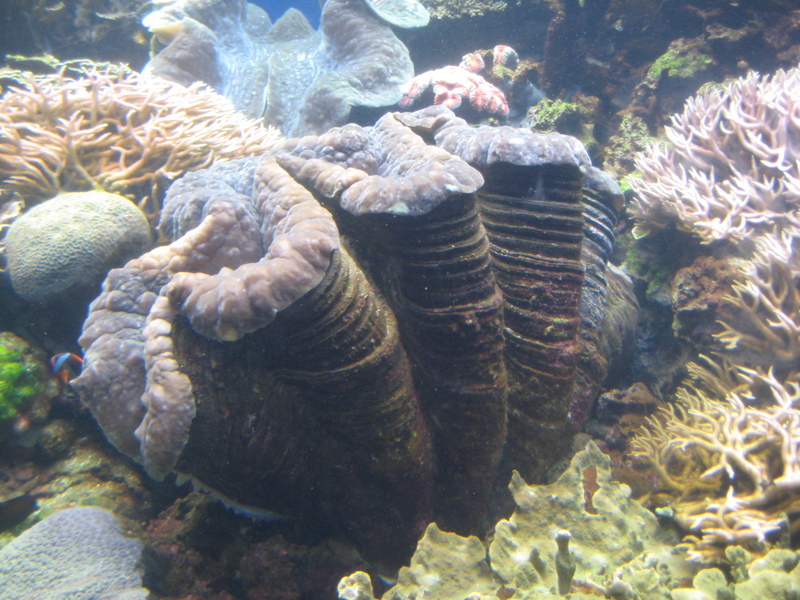 CP on the other hand had wiped clean his stack (of 3…instead of 2 because his was slightly lighter than mine). After our yummy breakfast, we had to make a stop in the Lego store we walked by on our way to breakfast because both CP and myself are big fans of Legos…but CP was just so excited to see a store with nothing BUT Legos. He ended up buying 3 Starwars character keychains (since it was buy 2, get 1 free) and walked out of the store triumphant and happier. 🙂 With this good start to the day, we decided to go see some of the “sights” of the island…you know, the tourist stops. It is in us both to do as much one can during a vacation (it’s more myself than anyone), so since we spent one whole day practically doing nothing…it was time to do something! 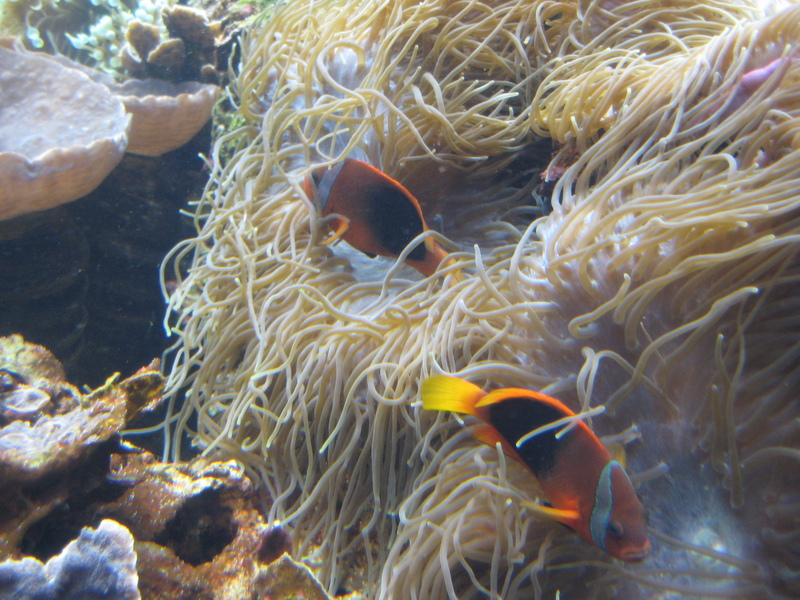 That’s why we spent the next 2 hours or so at the Waikiki Aquarium. 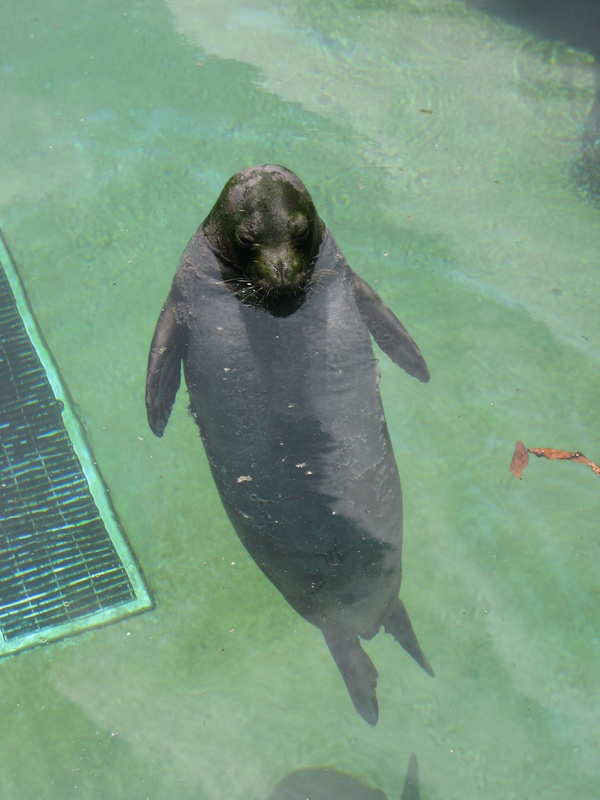 We learned that this monk seal is best known for “energy conservation.” CP and I both thought, “How appropriate for this vacation…perhaps we should take a page from its book and we could learn a few things or two on how to enjoy life.” I loved this seal because: 1. it’s just a blubbery cuteness and 2. lives the life I wish I could. 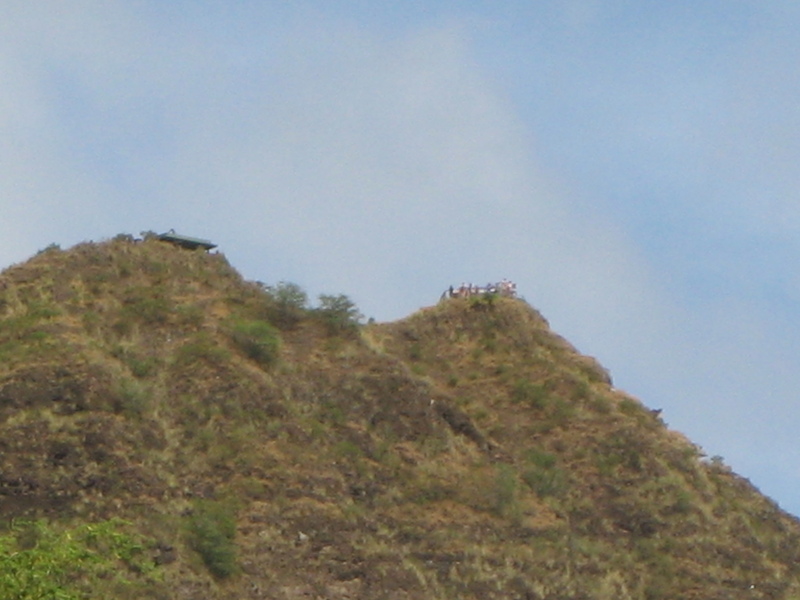 There’s CP as we left the paved lower part of the crater’s park, into the rough and uneven terrain. 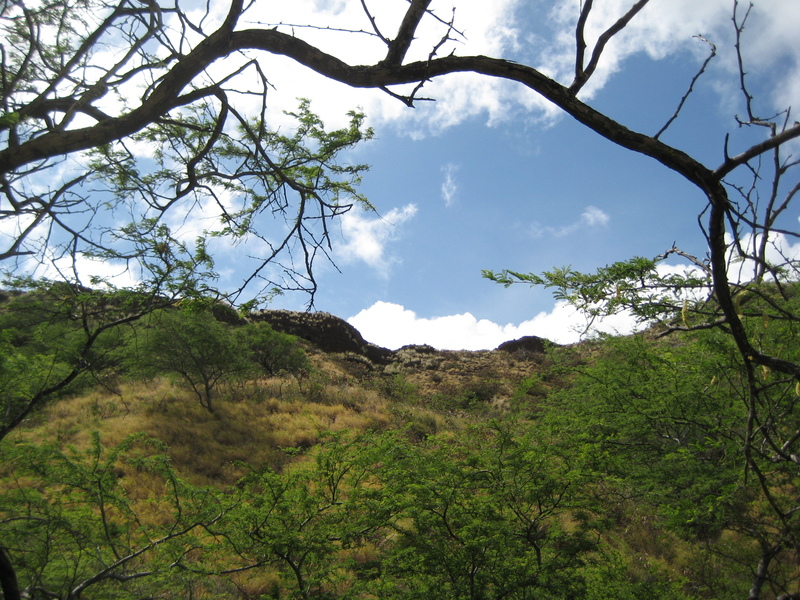 I took random shots throughout the hike, but we hit a point where I was using all my energy to keep myself from slipping and/or twisting my ankle on the uneven trail. After a brief break to catch our breath, cool off, snap some shots of ourselves…we continued our trek northward! 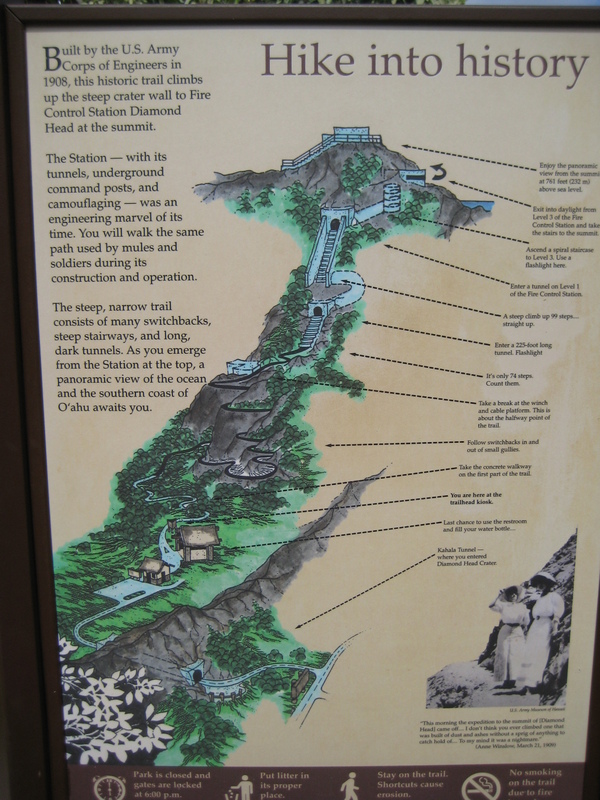 Let’s just say it was more uphill climbs before we hit some very steep stairs, followed by a long dark tunnel, then more stairs that were even steeper, then another tunnel before ending at…A SPIRAL STAIRCASE! (insert gasps and shock…feel free…I’ll wait for you 🙂 ). 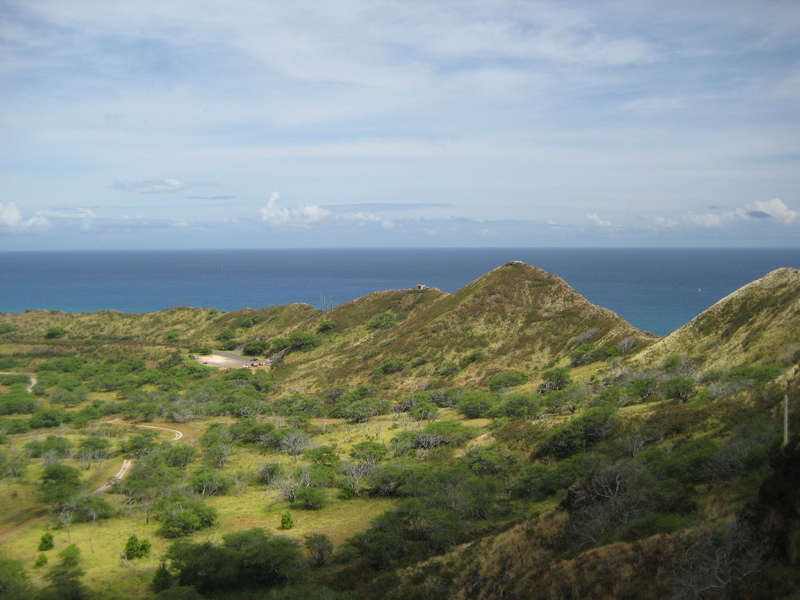 Once we made it to the top, we were reward with amazing views of the island. 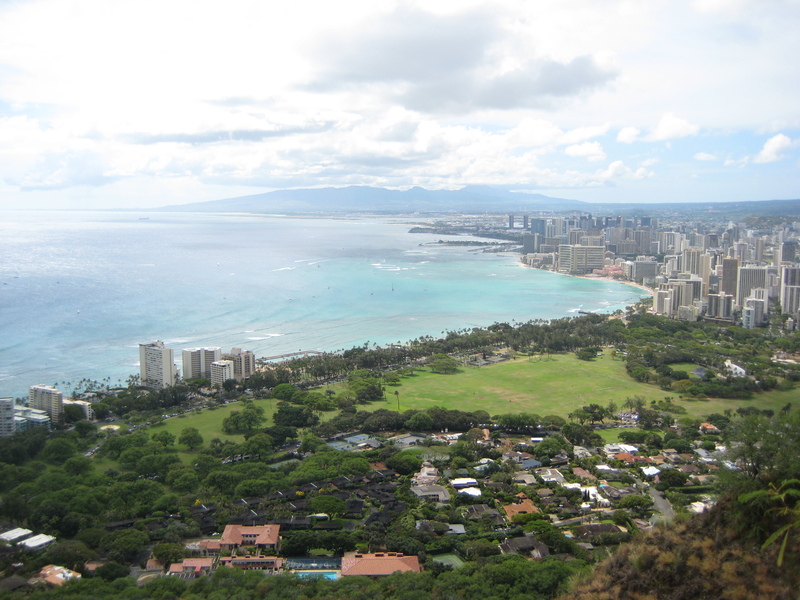 A perfect view down the shoreline of Waikiki beach, and the lush mountains of Oahu. Needless to say, CP and I were happy we had made it up to the top in one piece for wonderful views. Even though we were both a sweaty mess, we were champions of the crater for that moment! 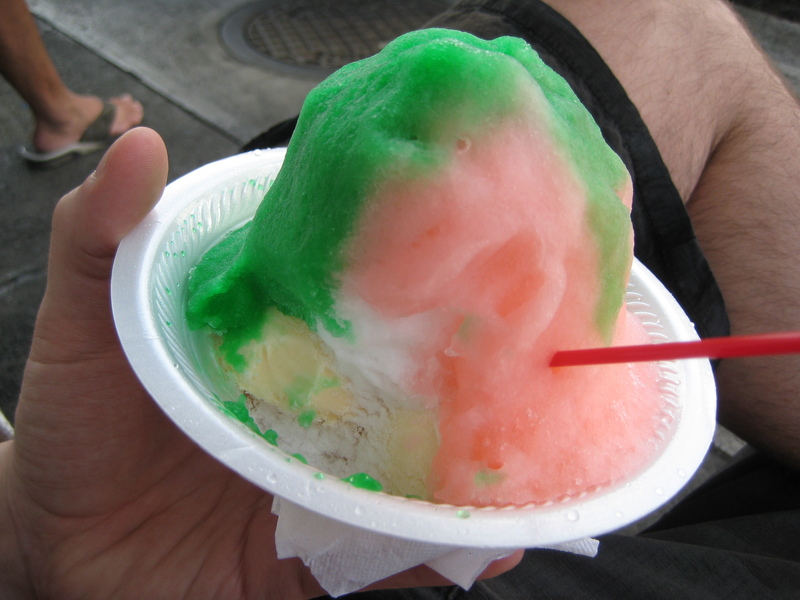 A lime and pink lemonade shaved ice over 3 scoops of vanilla ice cream for CP. Anyways…the conclusion to this story: CP was not only convinced, but HOOKED on it.! Mission: Complete. We basically wound down the day by the poolside again at the hotel in the waning sun light. For dinner that night, CP was craving a hefty hamburger so we ended up going to Cheeseburger Waikiki. This is a burger chain and…I really did not have anything to say about this place because I was not entirely pleased with my turkey burger. Not exactly what I would go for in Hawaii, but CP wanted his burger and according to him, it was quite delicious. 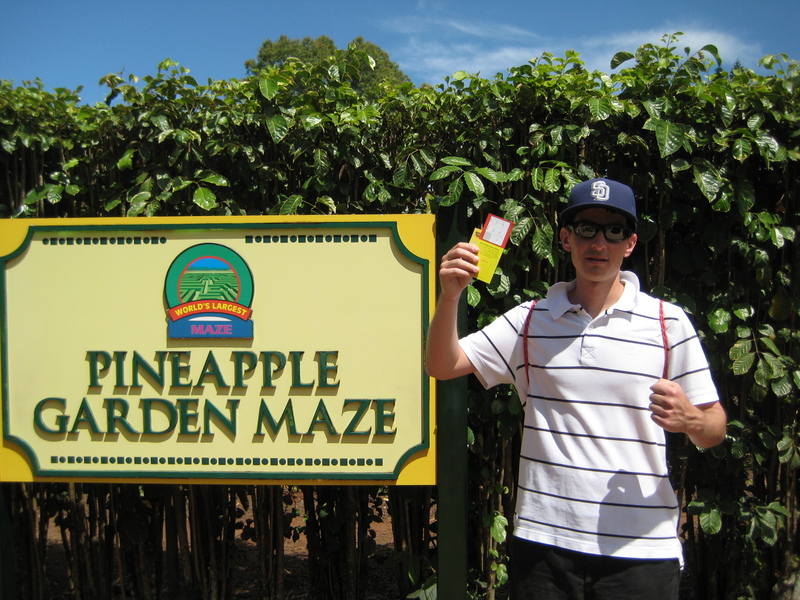 The following day, we decided to enjoy our day at Dole Plantation! 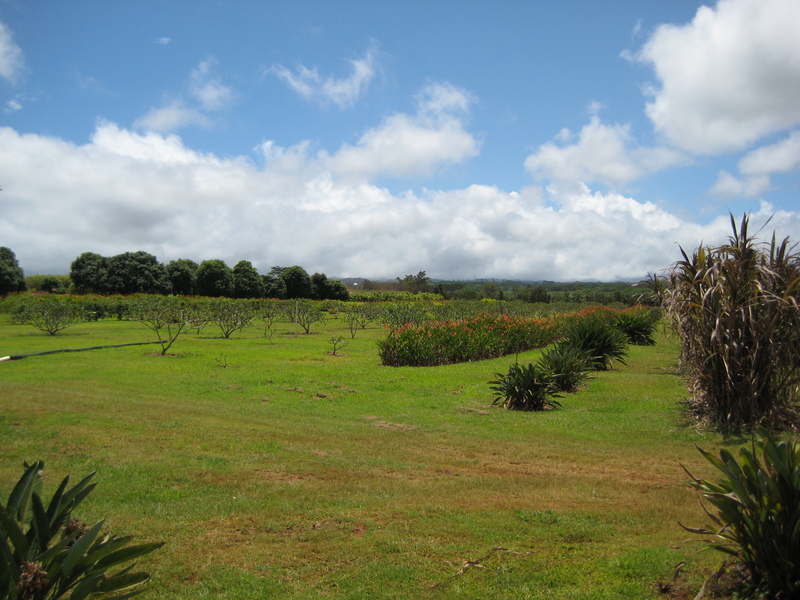 There were several attractions you could go to and learn about the plantation and about pineapples. CP and I went to all 3 attractions. First stop: The Pineapple Express (…yes, we both smiled and had an unspoken moment there). 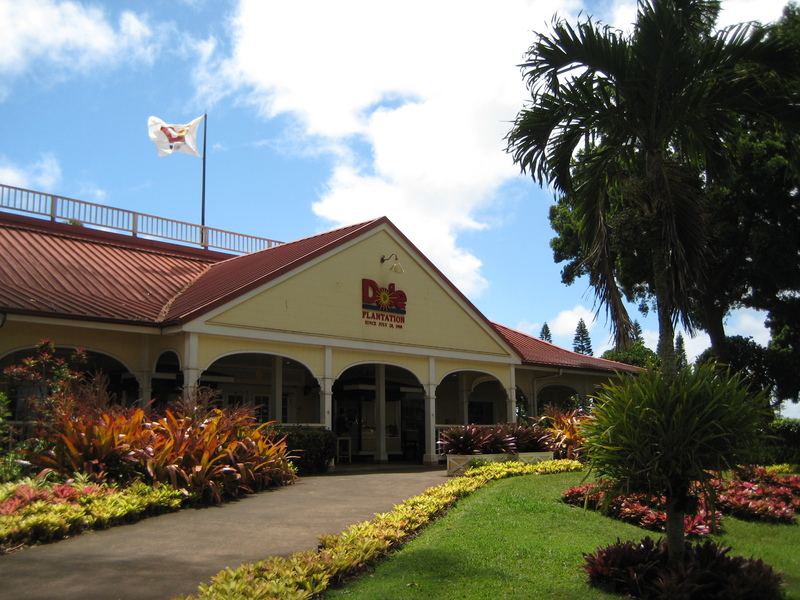 On this narrated train ride, you learn about the Dole Company’s history as you ride through the pineapple fields. During our visit, the fields were bare as the season had passed already. 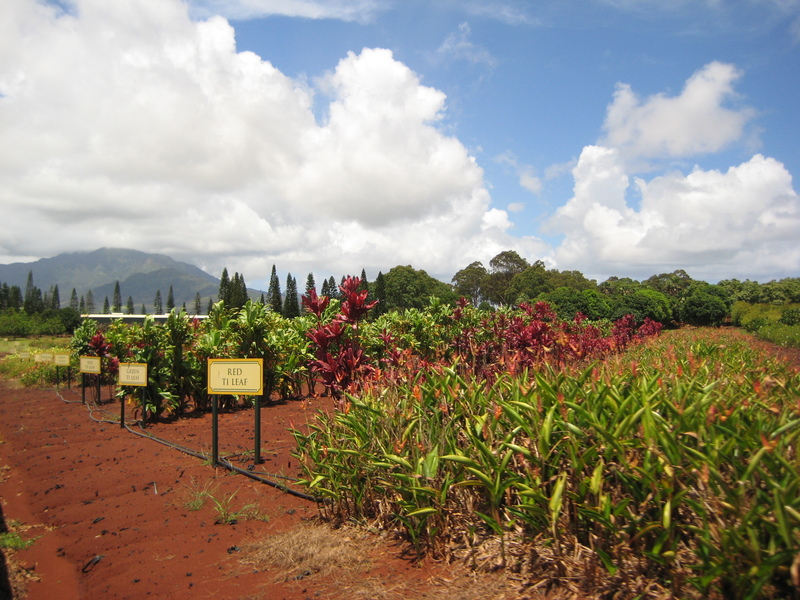 Given like any proper tourist attractions, proper planning included planting other crops that Dole grows, as well as showing the other fruits that are grown on the island. 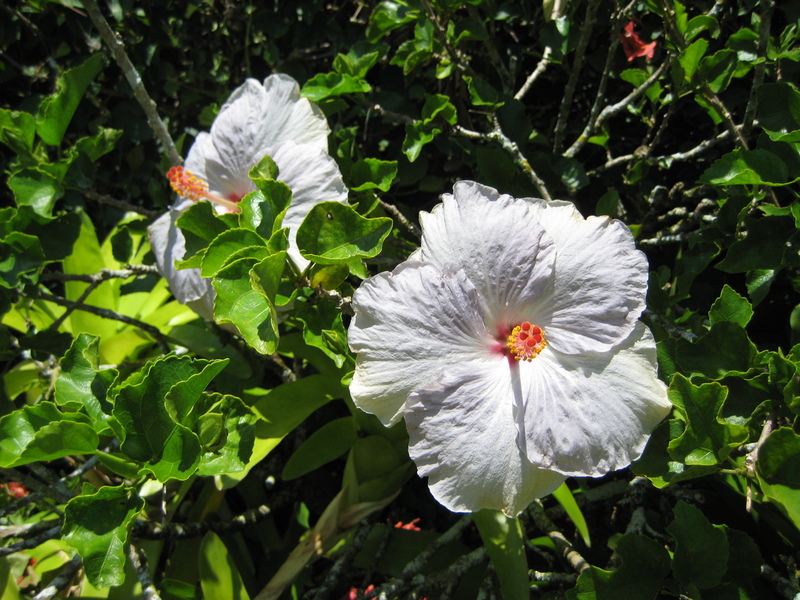 The varieties included: banana, mango, lychee, cacao, ti leaf, and others. Learn something new everyday! 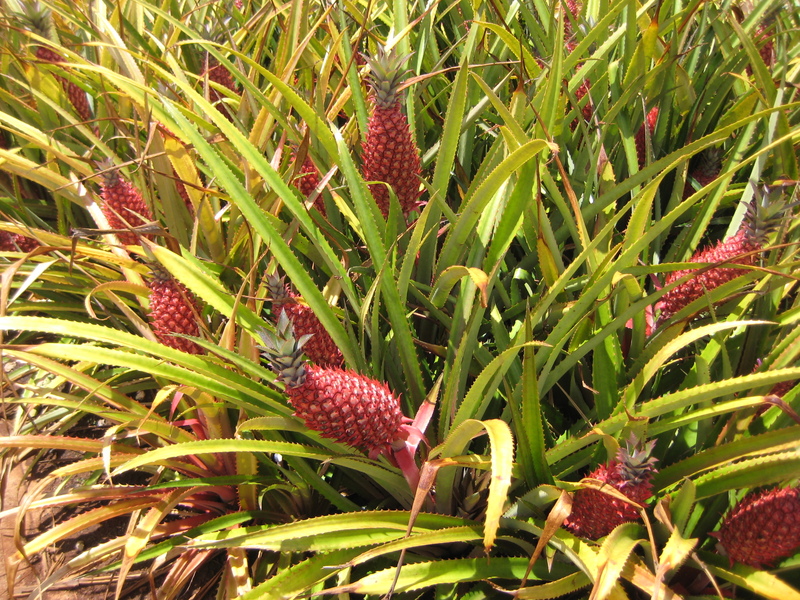 The Dole Garden was next, where you can walk through their garden area to look and learn about the native plants and the many uses of them. 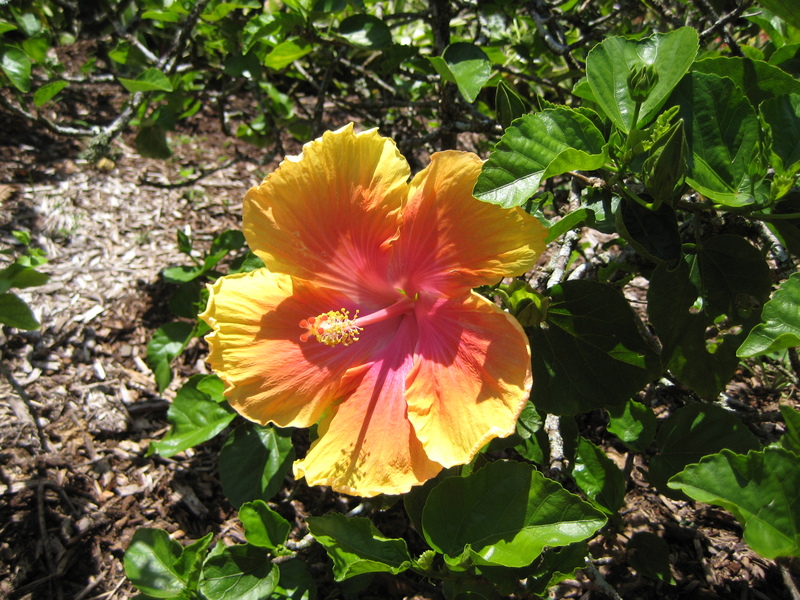 It was a gorgeous garden and a nice learning experience. We took a brief break to get out of the sun and re-nourish ourselves at the café in the shopping area. My choice of refreshment? 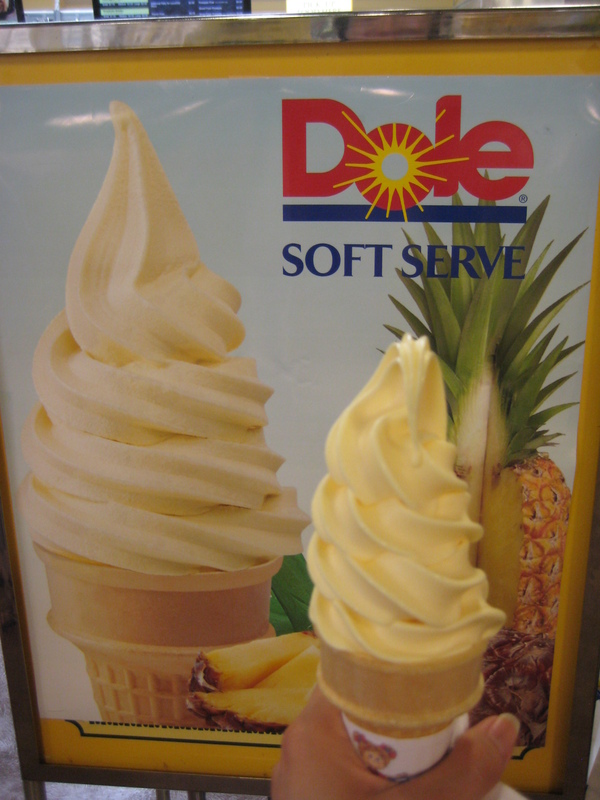 A Dole Whip! Strange as it may sound and look, it worked out quite well ! After resting ourselves a little to let the food settle, we headed to the world’s largest maze! The challenge: find all 8 “check-in” points in the maze as fast as you can. With our combined powers of navigation, a few mistakes here and there, CP and I successfully made it through the maze in approximately 2 hours. Victory yet again! 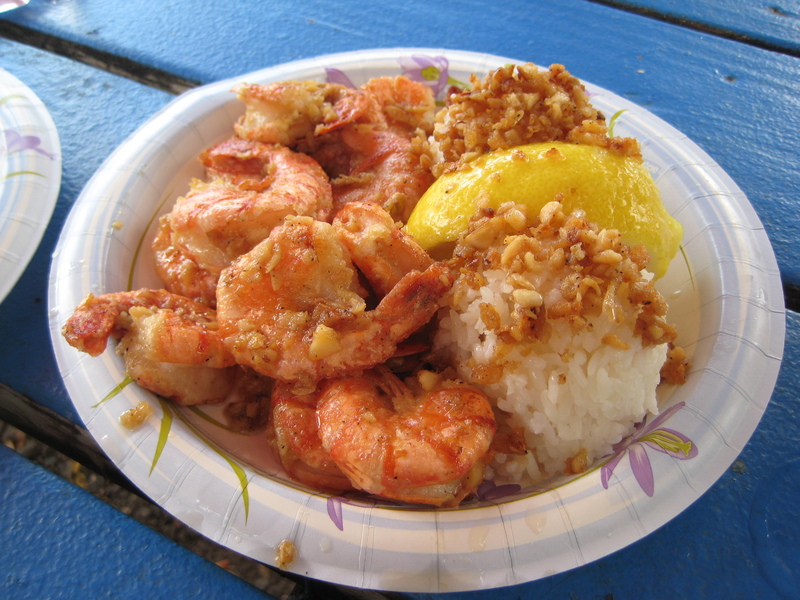 With our satisfaction of conquering the plantation, we headed north for our next mid-day snack stop and the signature food/destination of the North Shore: a shrimp truck. 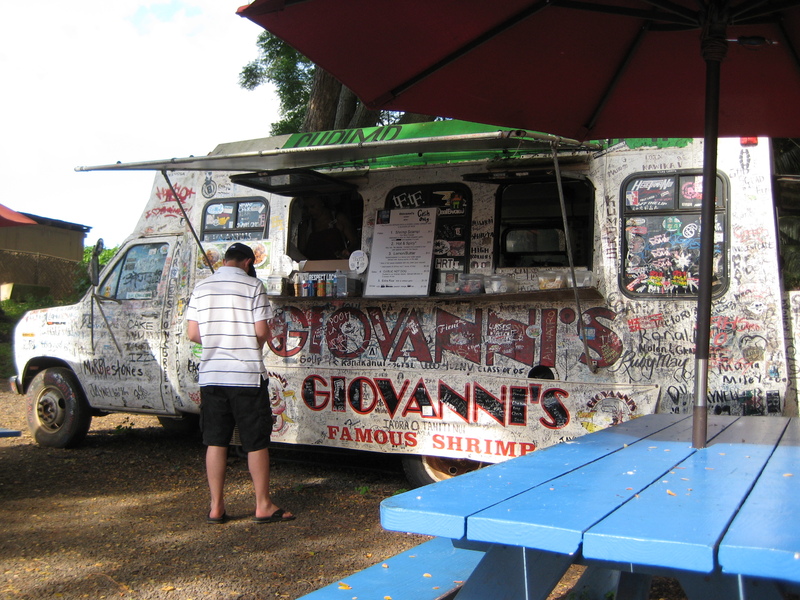 Our destination: Giovanni’s Shrimp Truck. Tucked into a little forest clearing right off the road, you would easily miss the truck even with a GPS (we had this issue several times during our trip) and we did. So we made a turn and made our way back. 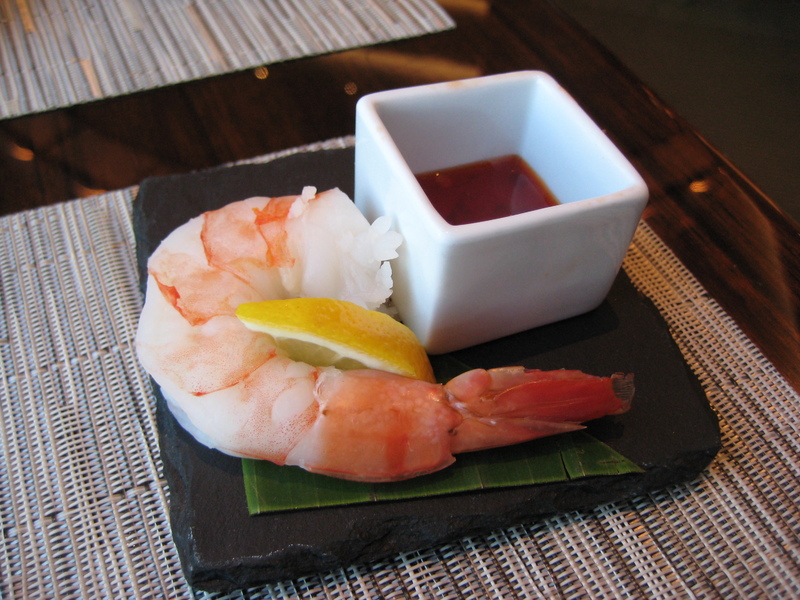 Their menu is simple and minimalistic, all surrounding the key protein: shrimp. Given that it was already well into the day, by the time we were there, all they had available was the shrimp scampi. That was fine by us, all we wanted was to taste the delicious, plump (not-so) little shrimp. 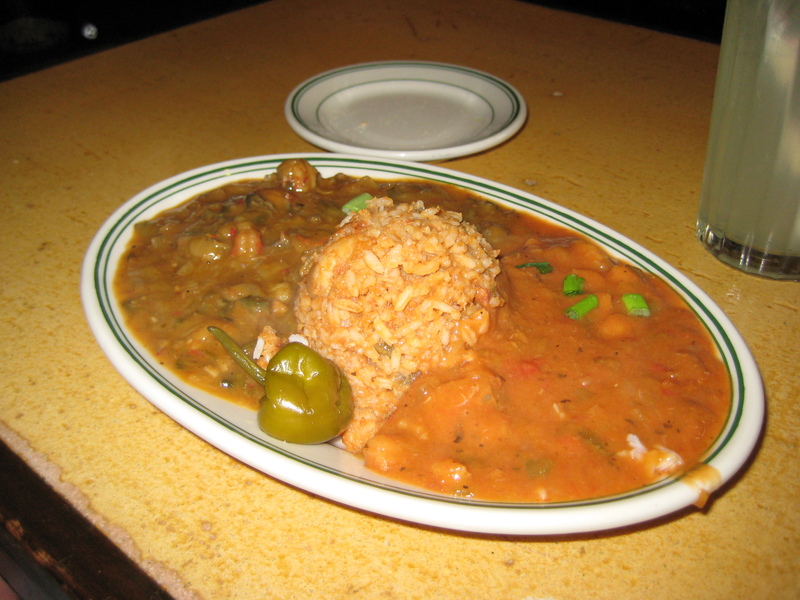 The order comes with a pile of fresh, cook-to-order shrimp (sans the head…thank goodness) and 2 scoops of white rice. The shrimp was cooked and bathed in a wonderful garlic, lemon, buttery goodness. To put it simply, here was what CP said to me, “I normally don’t have the urge to lick my fingers, but…” *proceeds to lick his fingers*. This is a sign because what CP said is true, we’ve eat BBQ and I have NEVER seen him lick his fingers. Whereas I have no problem with doing so…whether BBQ, Indian, anything! Thus, this just goes to show you how amazing this was. I can still smell the strong, sweet garlic smell as I write about it and it lingered with us as we continued on. 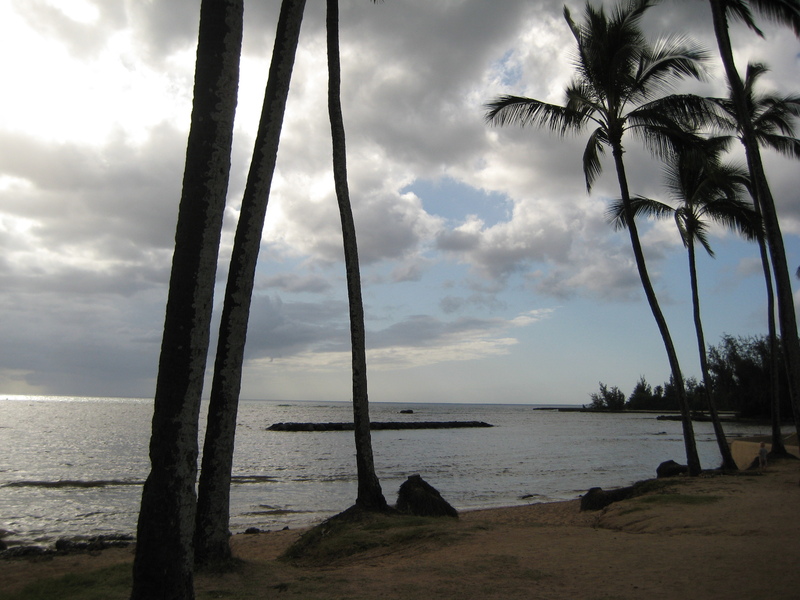 We took the drive up to one of the beaches in North Shore to dip our feet in. However, as you can see for yourself, a storm was brewing and yet, we thought it would just pass like it always did. Well…let’s just say that did not go quite as so. As we drove down the west side of the island back to Waikiki, the rain steadily started coming. 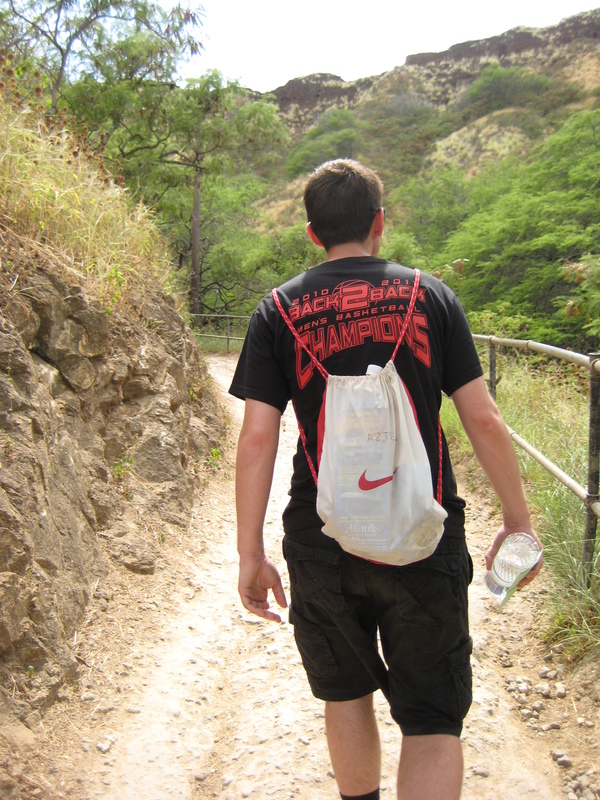 By the time we were back at our hotel in Waikiki, it was POURING! 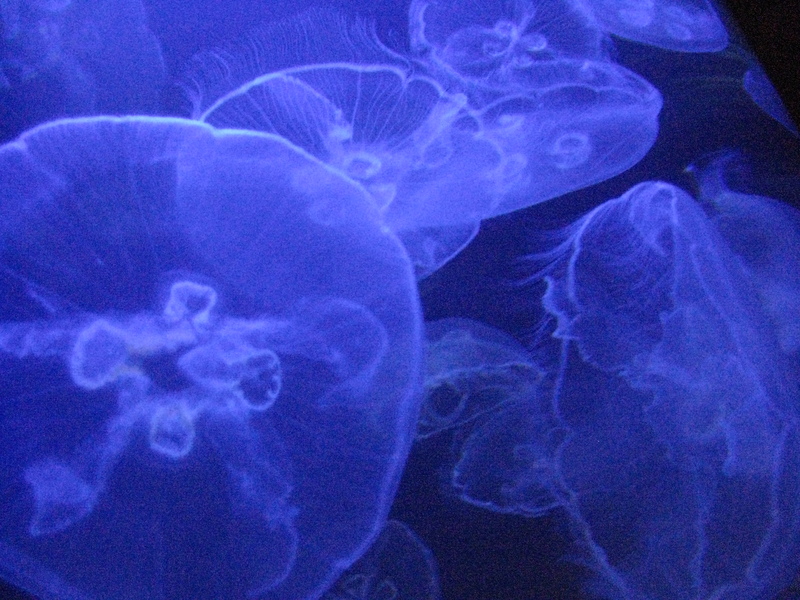 It was flash thunderstorm and it was as if the sky turned into the ocean and gravity brought down all the water to us. It was a mad house watching everyone trying to run for cover and the streets flooding within matter of seconds. At one point, one of the sidewalks slightly below the hotel’s main road was a miniature moat or more aptly, a cesspool. CP and I took refuge back in our hotel room to clean up, in hopes that the storm would pass. And fortunately for us, it did! We headed back out to grab dinner at Yotteko-Ya. This ramen house was small and tucked at the far end of a strip mall. Unassuming and you would never even think twice about it. The only way you would go: recommendations or you just so happen to be stuck at that strip mall. Otherwise, you would never find it. 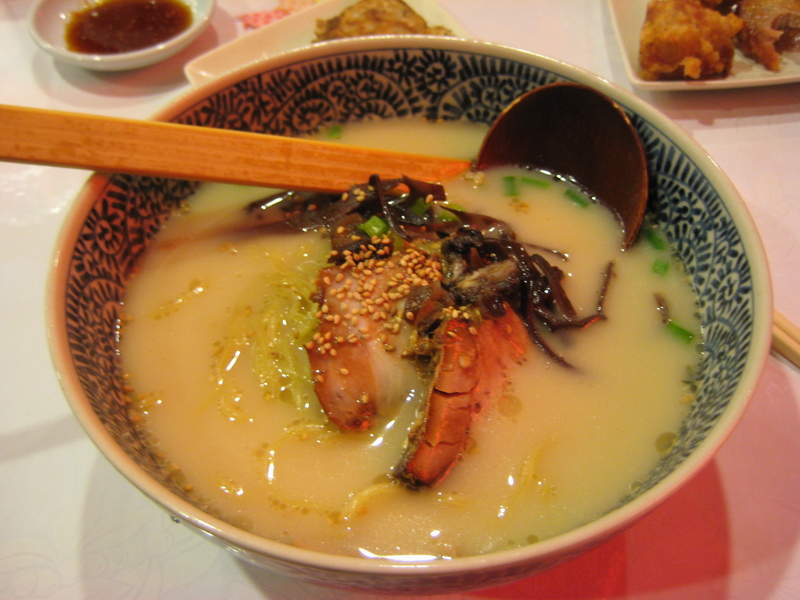 The restaurant specialized in ramen, but also served fried rice and appetizers. 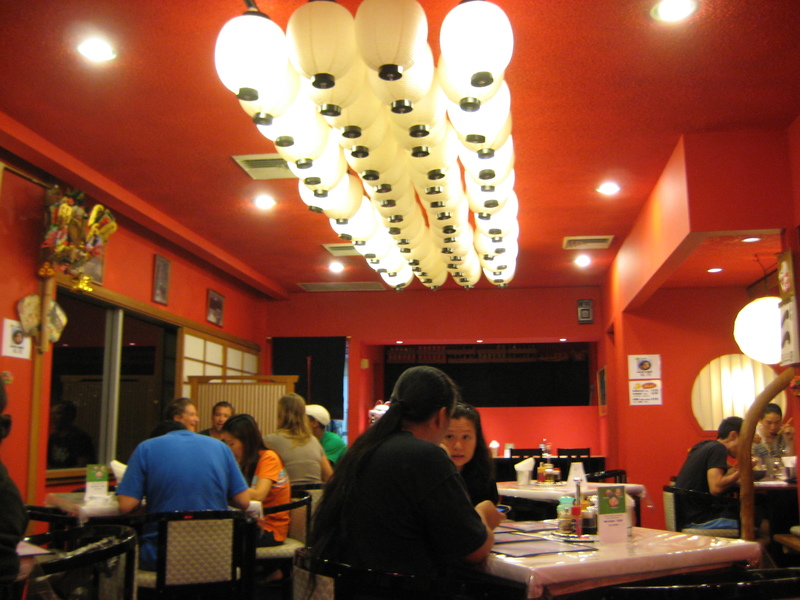 They also offered a set meal where you could choose an appetizer, ramen, and have either white rice or fried rice. The ramen soup base choices included: Shoyu, Shio, or Paitan. Paitan is a rich chicken/pork based broth and has a milky look from the cooked down chicken/pork bones. Also, you can choose how firm you wish for your ramen to be cooked: firm or soft. Both CP and I ordered the Paitan ramen with fried rice (no eggs for CP though) and the Kaarage/Gyoza (CP/me). The fried rice and appetizers kind of just fell to the sideline and to the back after we had our taste of the broth. Man…I really need a good bowl of ramen right now. There we go folks! Just two and half more days to go in Paradise! 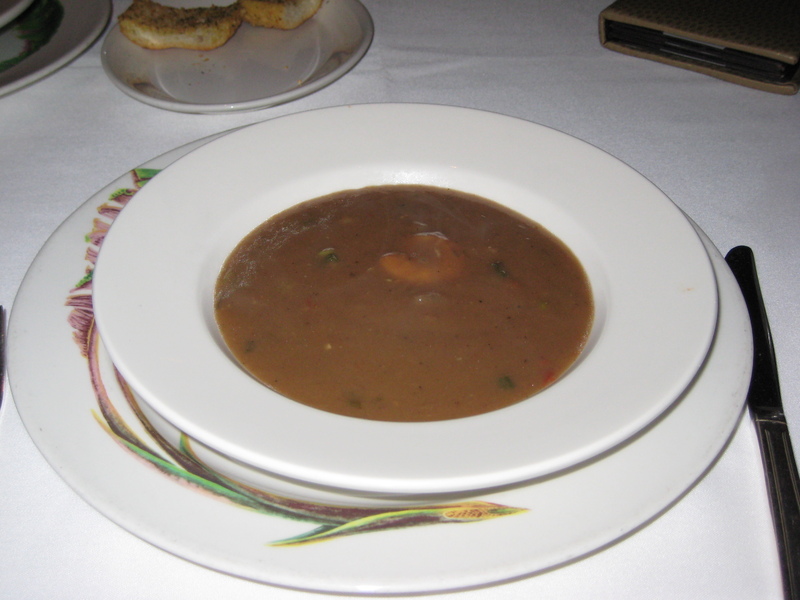 To continue and wrap up the last segment of the Valentine’s Day weekend with CP, on the morning of the end of our weekend in Vegas, I had planned for us to go to my new favorite restaurant in Vegas: MoZen Bistro. The restaurant is tucked in the elegant Mandarin Oriental Hotel and getting there was a little bit a discovery. However, since I have been to the restaurant it was not so hard to get to the second time around :). CP on the other hand thought it was quite hilarious on: 1. how hard it was to get to the restaurant (unlike other restaurants in Vegas) and 2. the door men and women were wearing full coats and top hats. Anyways…on to the food! So I was wondering what I would really get…turns out: it was a buffet style for appetizers, first course(s), main course is menu ordered, and buffet style again for dessert. It was definitely unique and once I saw the layout, I was excited! I wish I had taken a picture of the layout, but I can recall it by memory. Starting from the left and moving to the right as it wraps around restaurant: a fresh sushi station with pre-cut rolls made in small batches (2-4 rolls at a time) and cut to order sashimi. Next to that, was the salad and antipasto station with a wide selections of cold cuts, grilled vegetables, salads, and cheese. Following that was a table of fresh fruit from melons, pineapples, mix of berries. Last but not least, was a table spread of cold breakfast items such as pastries, cereals, yogurt, and such. Finally, the dessert station was actually off to another side of the restaurant that wasn’t as apparent since it was tucked away in a corner. However, you can never hide desserts from me! Almond Croissant, Spicy Tuna Roll, and Seaweed Salad. 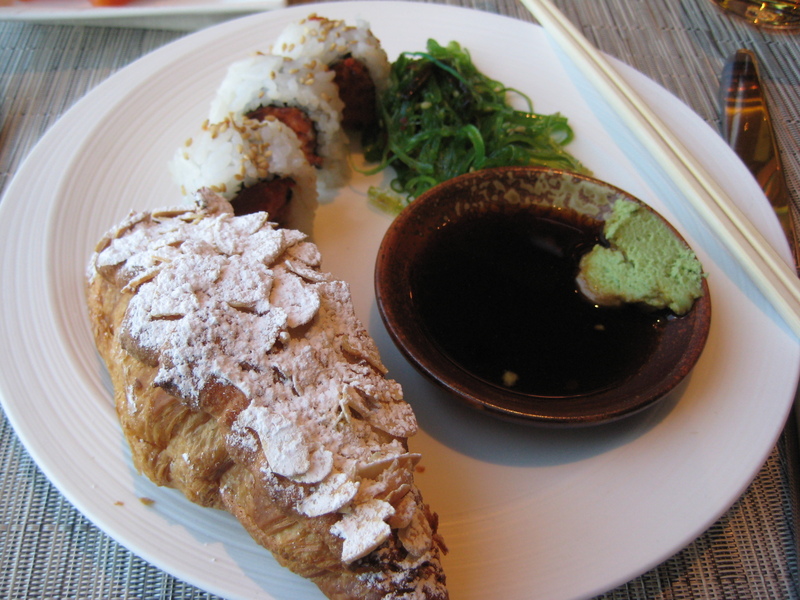 I know, I know…Why did you get an almond croissant with sushi!? Ok, look…I LOVE almond croissants and I could NOT resist when I walked by. I had to get one, but rest assure…I did not mix the 2 together while chewing :). The tuna was so fresh, nice and spicy to the way I like it and the sushi rice was perfect. The salad was a nice crisp, refreshing palate cleanser for me and I moved on to the croissant. My, my, my…so fabulous! The pastry was flaky and crunched each time I bit into it. Inside was the ever delicious almond paste to add to the decadence of this pastry. 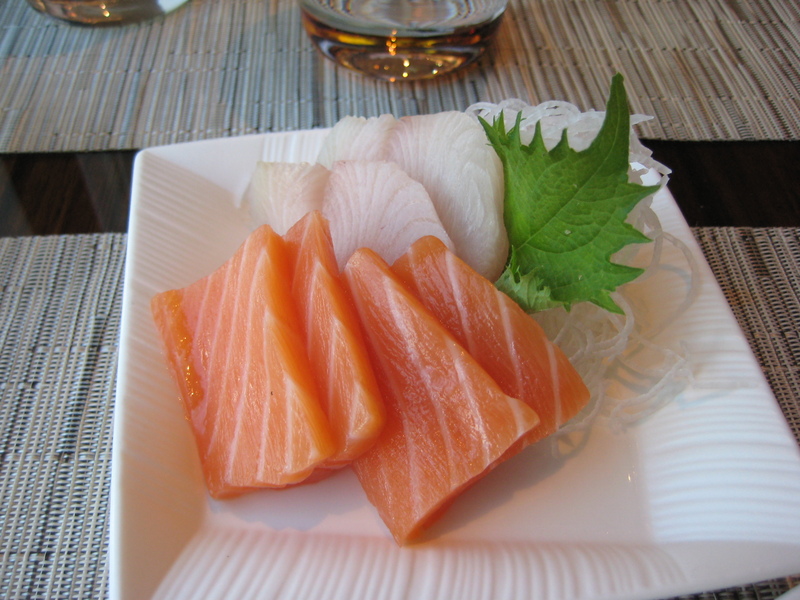 I also got myself a plate of yellowtail and salmon sashimi. 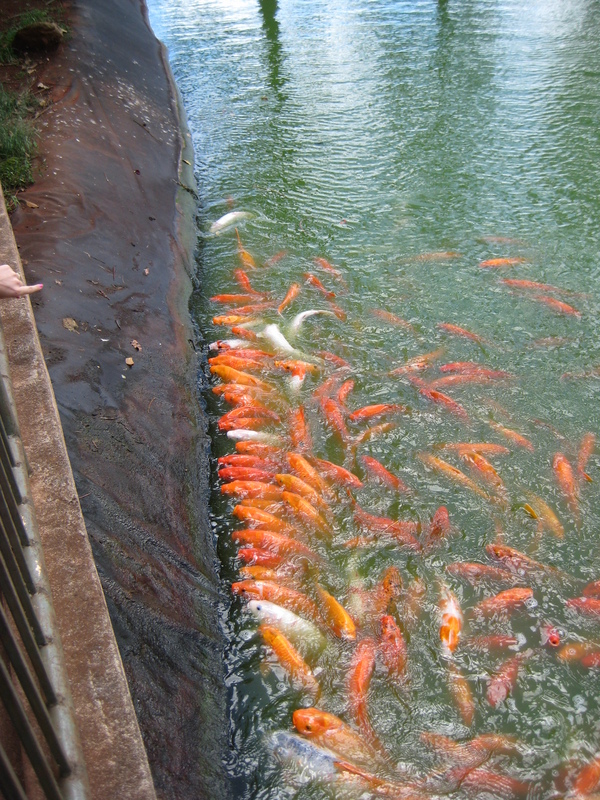 My only complaint with the fish was that I could tell it was fresh, but it was TOO cold. Sashimi should be chilled, but this was TOO cold and it made me a little sad because I really liked it and the temperature just ruined it for me. 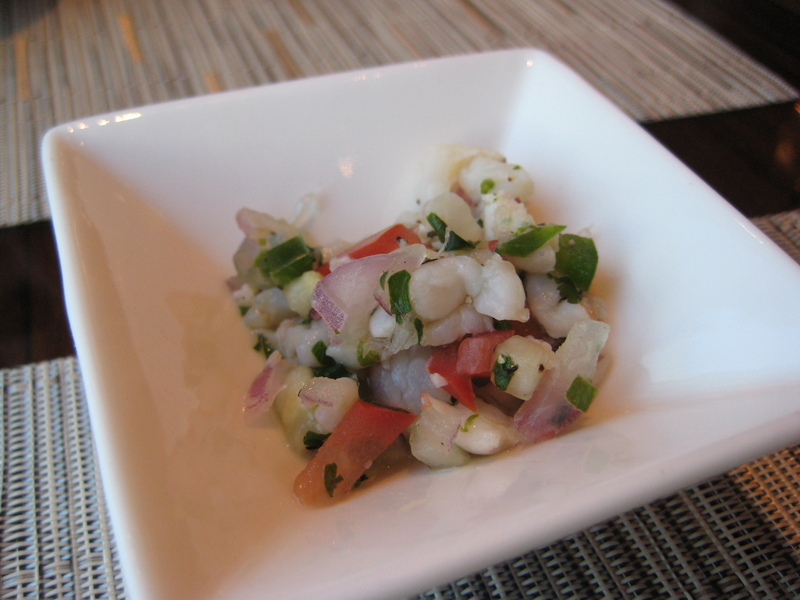 Still…I enjoyed this little plate of fish goodness. OH! By the way, part of the brunch experience of MoZen includes random little “additions” to the meal that comes as little taster dishes. They were all different and I’ll just let the pictures do the talking! There was also steamed mussels and fresh oysters. Insane right?! 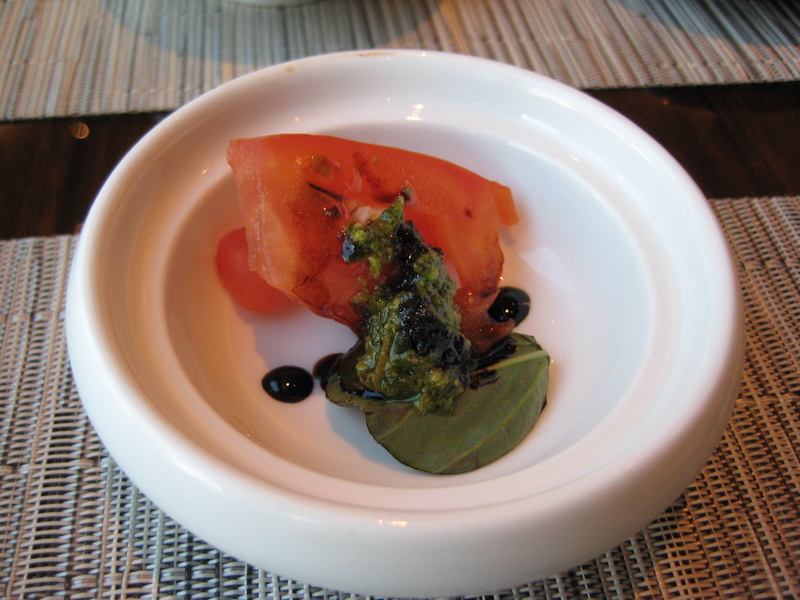 And this was just additional dishes that acted like bread and butter that would be passed at other restaurants. MoZen really knows how to make their diners feel like they’re a million bucks without necessarily spending a million bucks! Love, LOVE it! 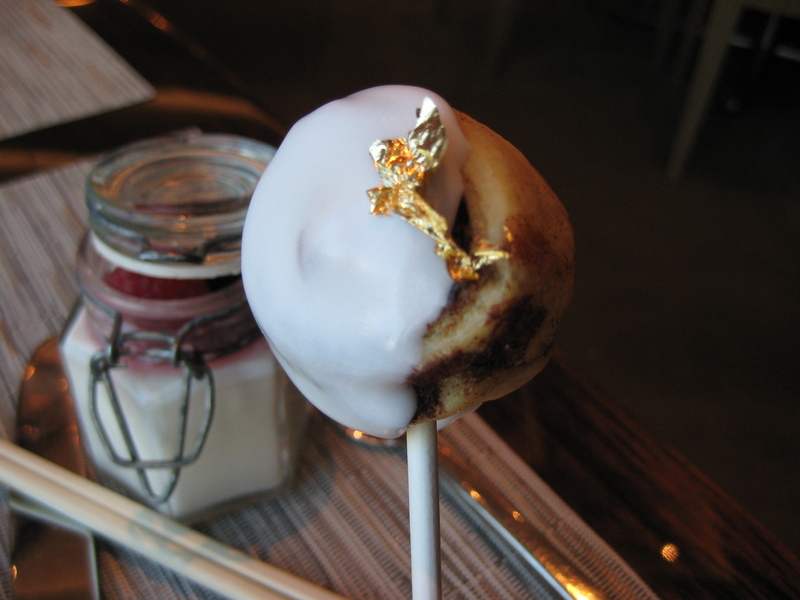 This was a mini cinnamon bun lollipop with edible gold leaf! In the background is a mini mason jar with plain yogurt and fresh berries. I did not particularly like either of the two taste-wise, but I do like the presentation. Not a surprise right? 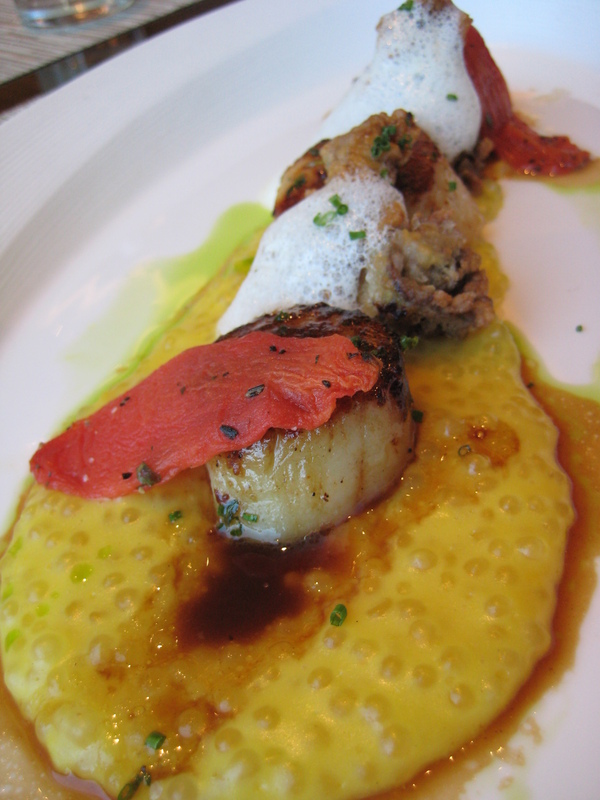 Especially if you know me or have been reading my rants – the Pan seared scallops with tapioca pudding, fried buttermilk chicken liver, bacon & poultry jus. I was very hesitant on the chicken liver because I have had chicken liver in this rice dish my mom used to make for us during the winter, and I did not like it. However, once again by battering and deep frying will always make everything taste 10x better! I really loved the liver surprisingly. The scallops were seasoned just right (unlike the over salted ones I had the following day at Mister A’s), but it was over cooked. 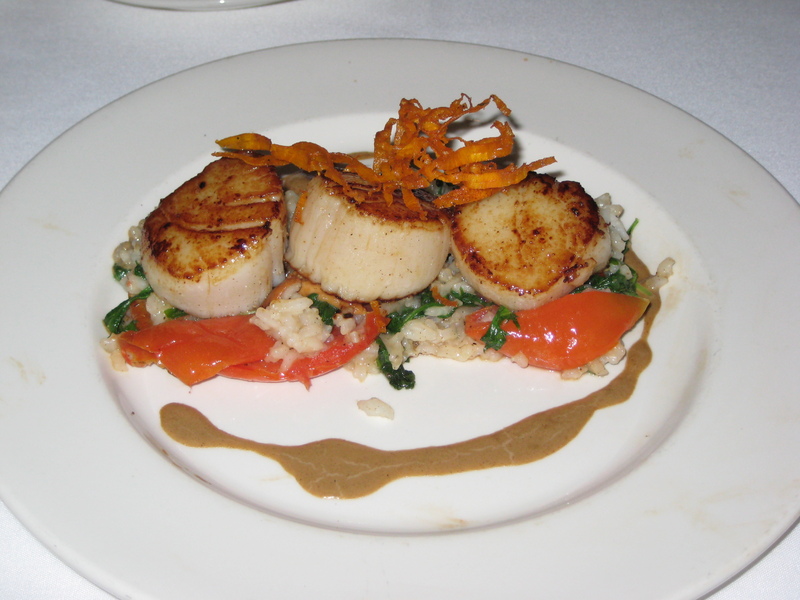 If only I could take the seasoning of these scallops, with the scallops from Mister A’s, I then would have the PERFECT scallop! 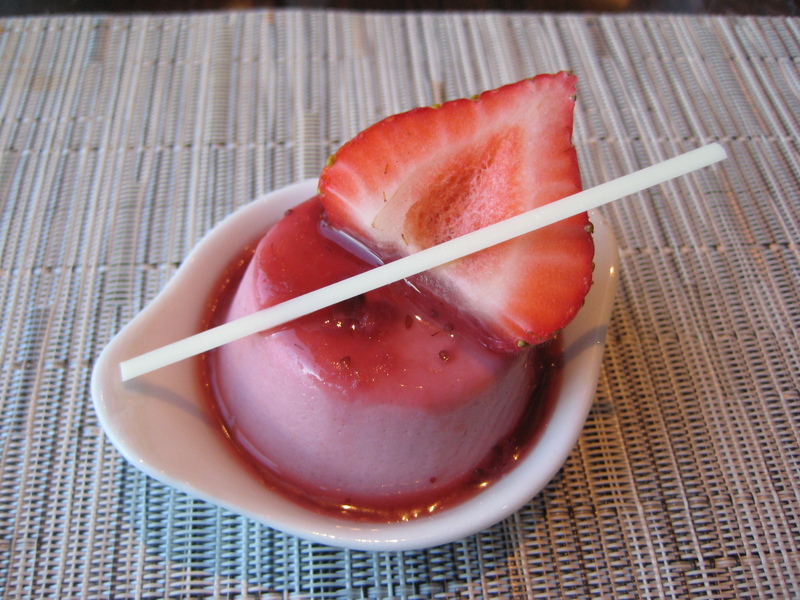 Still the dish was really enjoyable with the tapioca pudding, which made the dish fun to eat even more. The Tekka Don – Marinated big eye tuna on a bed of warm Japanese rice with nori, served with miso soup. 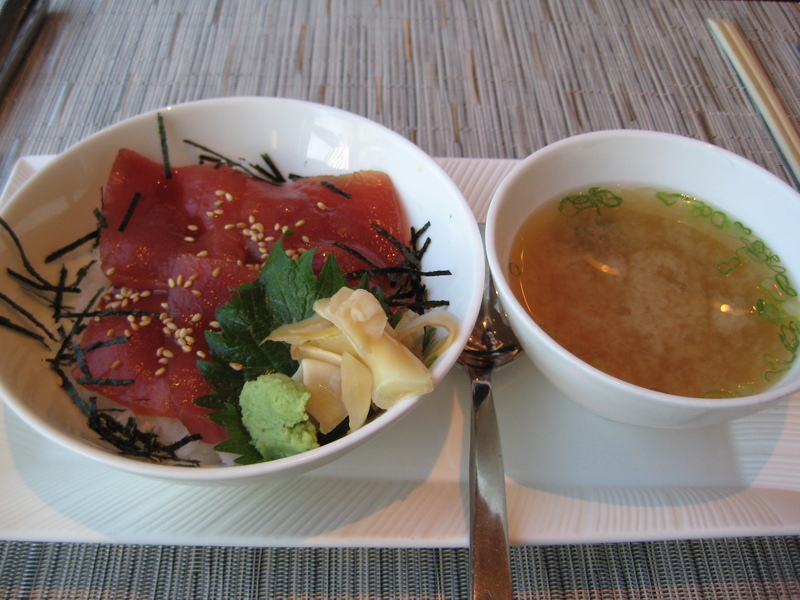 Basically, the marinated tuna was like poke-style marinade, but sashimi sliced. CP had a dried out, sore throat so this was perfect for him. He lapped up both bowls and loved every bite of it. I smiled as I watched him go at the food, reminding me of how his enthusiasm for food has grown so much in the last 3+ years we’ve known each other. 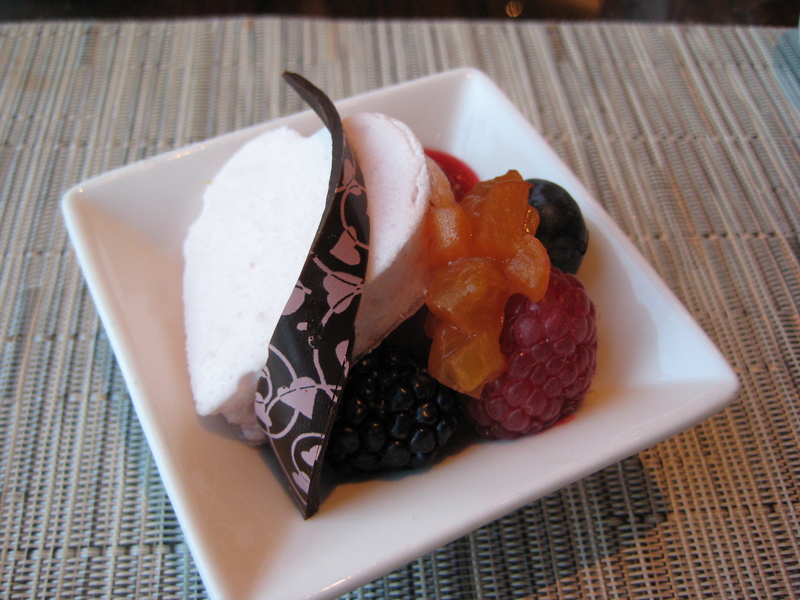 However, the one food group that I have still yet to fully bring CP over is…DESSERTS! I tried 4 of the multiple options which also included cheesecakes, mini cupcakes, etc. 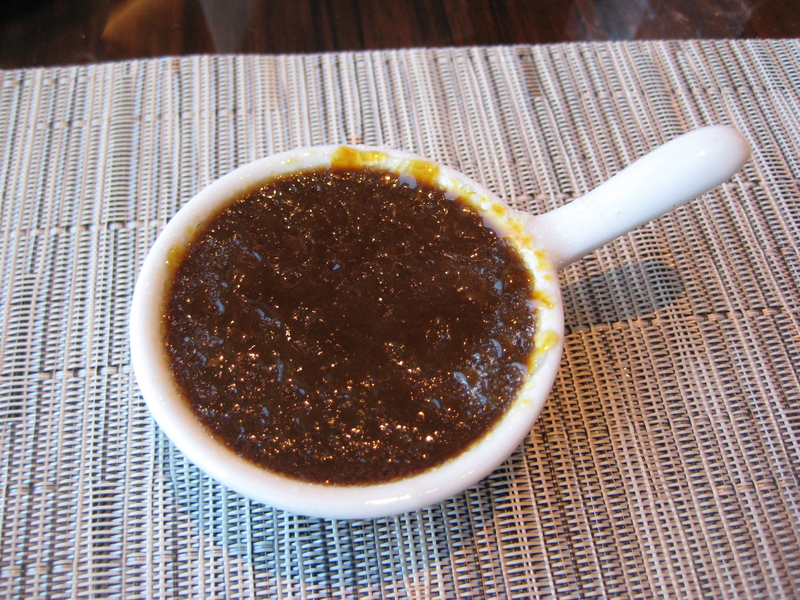 My favorite: the INTENSE coffee infused creme brulee! All in all, this restaurant has done me well again! I’ve been here for dinner and now brunch and both times were amazing. Thank you to the cooking and waiting staff for an great afternoon and delicious food! Weekends when it is not a travel day, is typically a sleep in day. However, I have been craving breakfast foods lately and I just could not walk away from it. 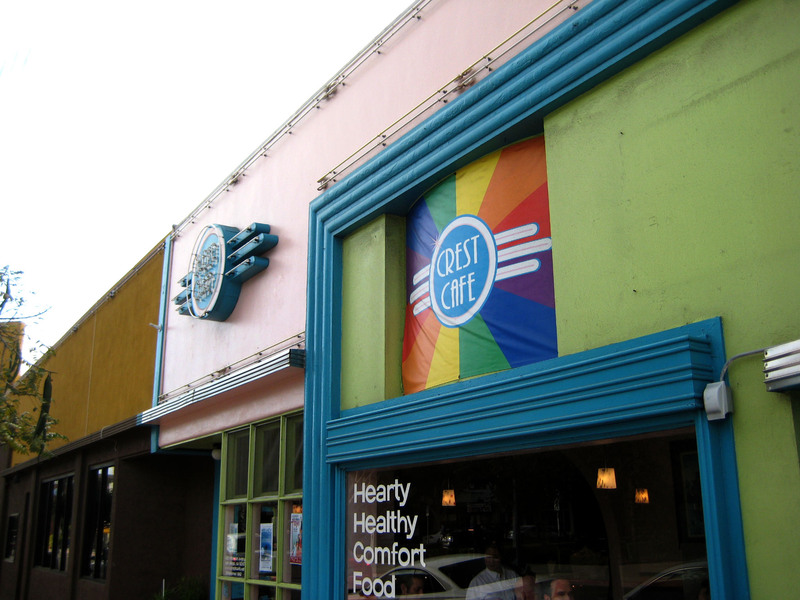 So I grabbed my best friend LA to head to Hillcrest this morning to Crest Cafe since I had bought a Groupon (my new love). We made it to Hillcrest a little past 8:30am and the streets were pretty empty so finding a spot on the street was not an issue. Great start! As we approached the cafe, I looked into the front windows and saw at least several tables open so that means no wait!! LA and I were seated almost immediately in the tiny cafe. I can see how easily this place would get packed during peak brunch hours. Given that we both gave up Sunday morning sleep, we were rewarded with a nice table right by the pick up window. Now it was time to chow down! Once I got coffee into my system, everything seemed to be brighter despite the clouds in the sky. Best part: it is unlimited refills! 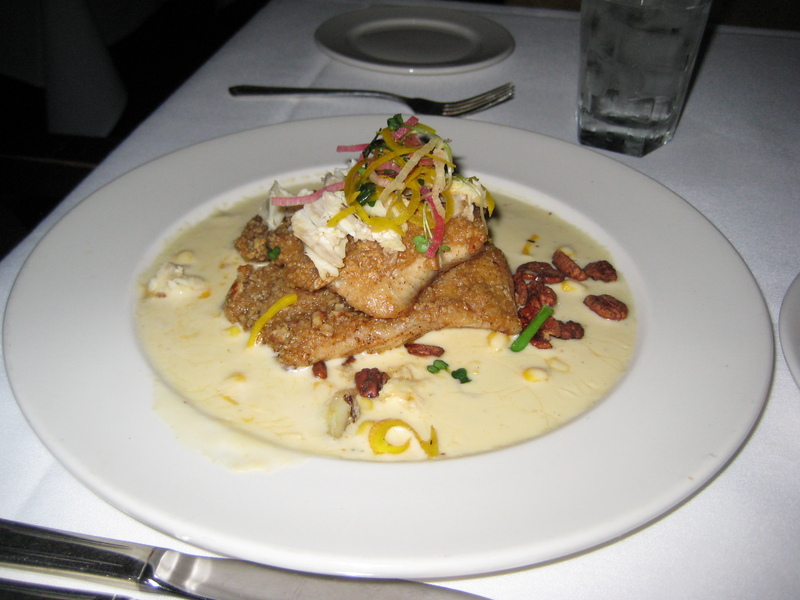 For our entrees, LA went with the cafe’s signature dish, the Creme Brulee French Toast. Now I will let you absorb this picture of the pile of amazing-ness! It is 2 thick slices of bread, cut diagonally, soaked in a sweet egg wash and grilled on the flat top. 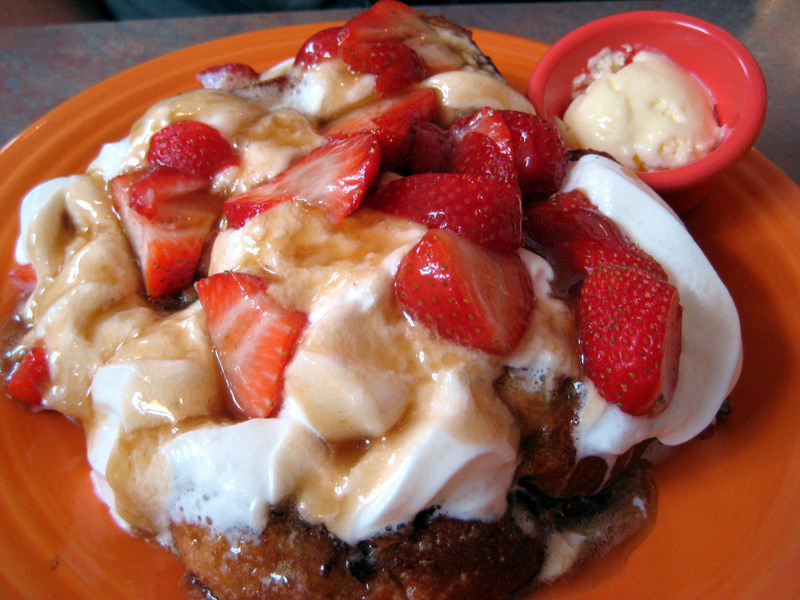 Topped a huge pile of the whipped cream, fresh strawberries, and a light caramel sauce. The Crest Cafe Creme Brulee French Toast lived up to it’s name since it did remind me of creme brulee. Although I loved the taste of it, but it was really sweet so I don’t think I could ever have the whole plate by myself. Yes…it was a big plate of food! 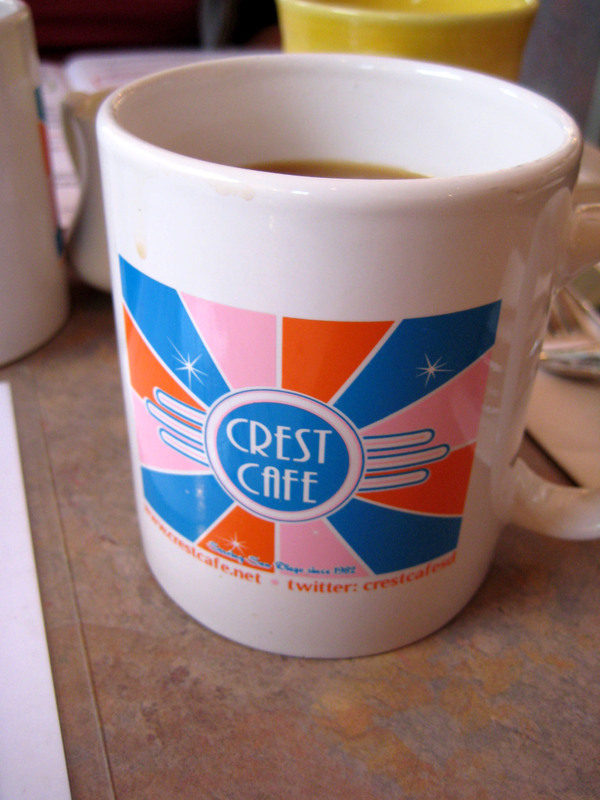 Crest Cafe offers to make all their egg selections as either an omelette or a scramble and I prefer scrambles. The Ortega comes with 4 eggs, Ortega chile, salsa fresca, hot pepper jack cheese and spicy chicken sausage. 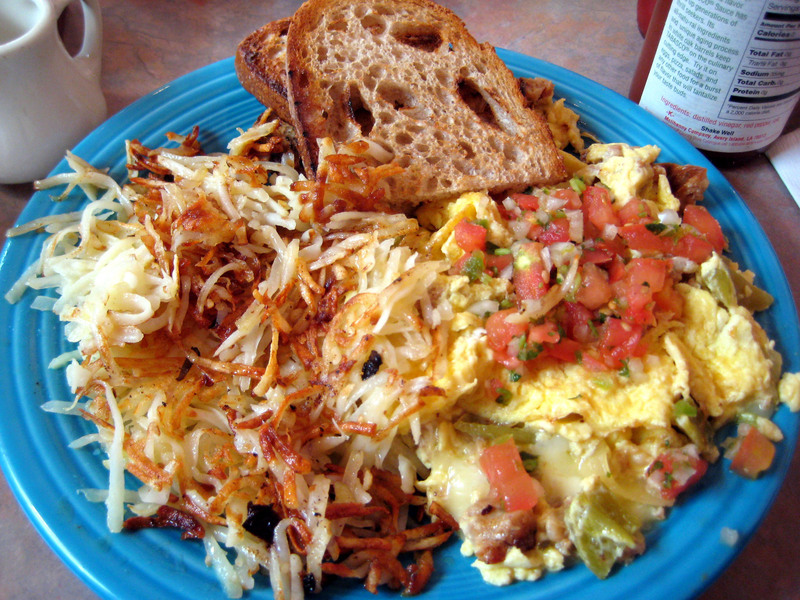 It comes with a choice of hashbrowns/homestyle fries and toast, tortillas and beans or cottage cheese and sliced roma tomatoes. The scramble was great! Granted, it was way too much protein for me, but I still loved it. The spicy chicken sausage was hot and I wish I had more. My side choices was whole wheat toast and hashbrowns. Some of the toast was burnt, but the slices that weren’t made for a great vehicle for my scramble! Hashbrowns are one of my favorite breakfast sides, but the problem is that I will admit…I prefer restaurants using butter on the griddle rather than oil. It adds flavor while crisping the outer layers, but with oil…it just adds no flavor and it ends up just oily. Sadly…these hashbrowns was just oily and tasteless. Overall though, I had a great experience. I had browsed through the reviews on Yelp and have heard of the terrible service others have received. However, I can see that when this place gets packed that the 2 waiter team would be terribly swamped. Having worked the restaurant industry, I know what it is like and I try my best to give them the benefit of the doubt. I cannot say how good their lunch and dinner is, but breakfast was darn good.